Imagine Night at the Museum, with mystical shenanigans aplenty and a special effects budget through the roof. Now picture the garden version. That’s pretty much what best explains Fairchild’s Night Garden that my fam and I experienced this past winter break. While we didn’t have anyone younger than 10 with us, like we probably should have, we still thoroughly enjoyed the impeccable light show and themed adult beverages. The whole gimmick seemed to be aimed at the kiddos, as the name of the game was to find several fairies scattered around the garden grounds and piece together the clues they provided. While we mostly forgot to upkeep the fairy hunt, the meticulous attention to detail and large scale production value was not lost on us. Fairchild has been one of my favorite places to visit when I’m back home in Miami, mostly because of its evergreen splendor but also its strong ties to my childhood and the fact that being there always feels like home. 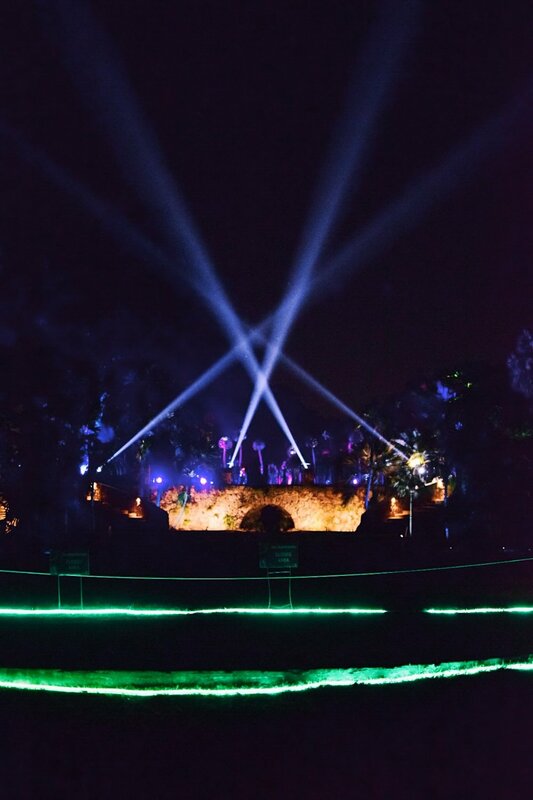 In all my years visiting, however, they’ve never done an event quite like this where the open up the garden at night and manage to make all of their natural majesty even more grand. 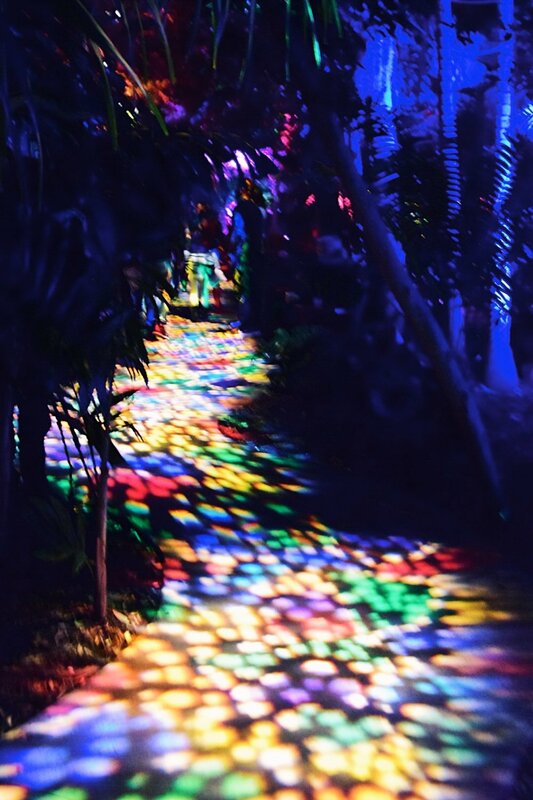 Pathways glowed in speckled hues. 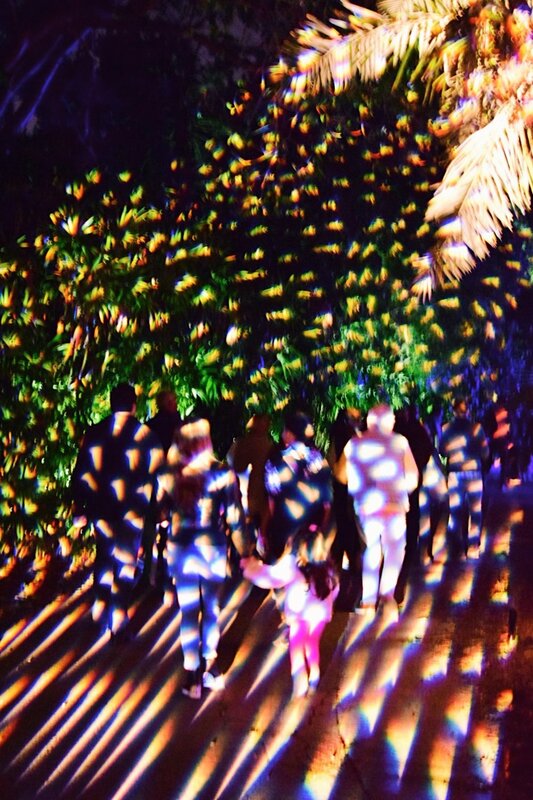 Each tree was bathed in an spectrum of multicolored lights. 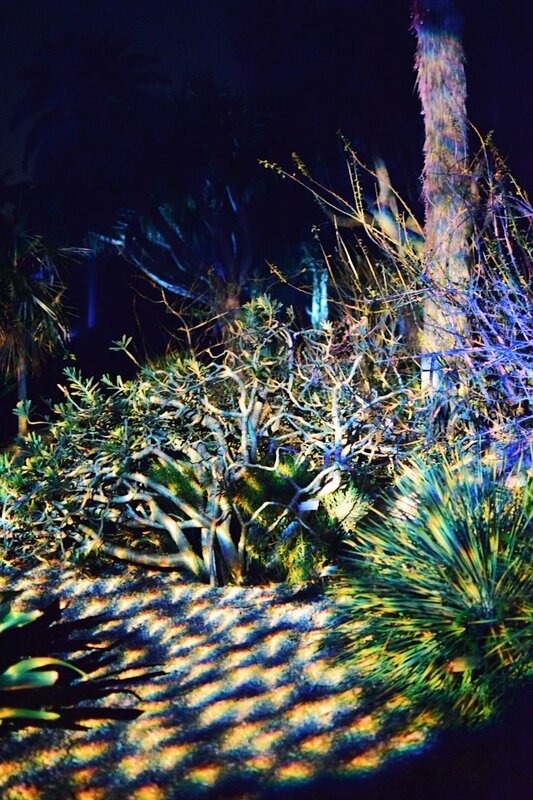 Animations were projected on waterfalls and flat leaves. Larger than life dandelion structures flanked walkways. And artificial snow was even blowing - an honest effort at creating a winter atmosphere in 60 degree Miami. While the kids visiting were on another planet with excitement and awe, I must say that we “adults” were enchanted too. It’s a wonder how nature can be made even more beautiful, and seeing our city glow even brighter in the night lights made us fall in love with home all over again. 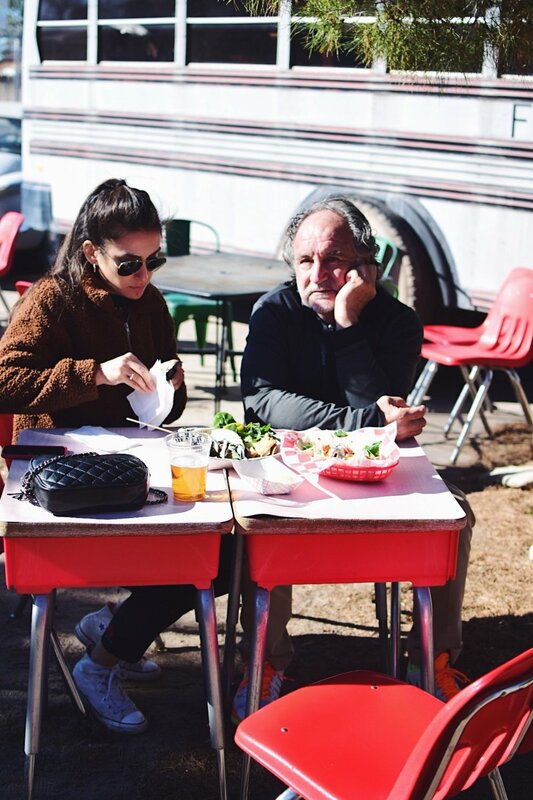 This past week, per our apparently annual family roadtrip, Mo & Co traveled to Marfa, Texas. Never heard of it? Don’t worry, neither did the majority of Texans we encountered. How’d we decide on this place then? A mix of “We need a place not too far, but not too close. Not too warm, but not too cold. 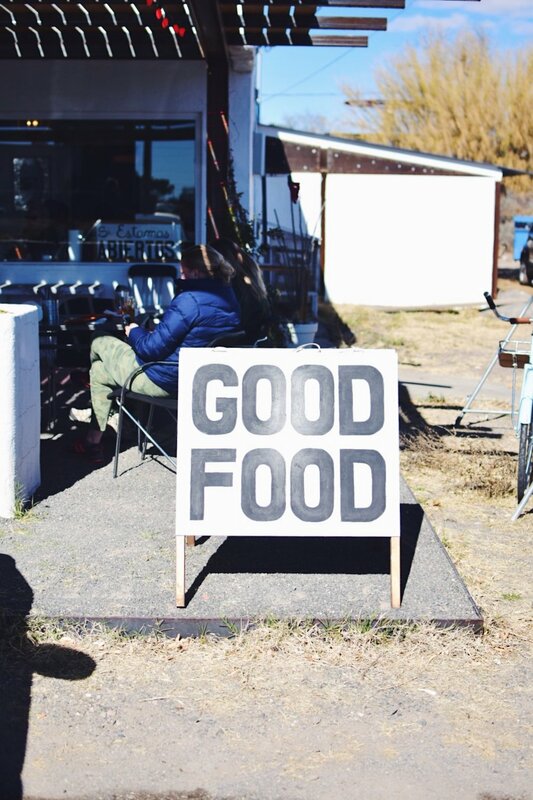 Something off the grid, but on the grid just enough.” Thanks to Parts Unknown, this recipe cooked up an Anthony Bourdain porridge that satisfied us for our four day stint. 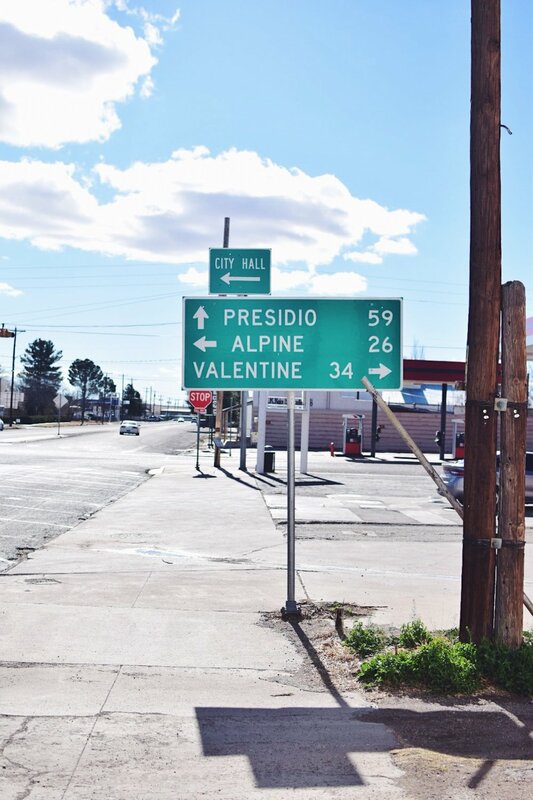 Since Marfa spans a radius of about 3 blocks, it does not have an airport. Well, it hardly has cell service, but we won’t get into that. 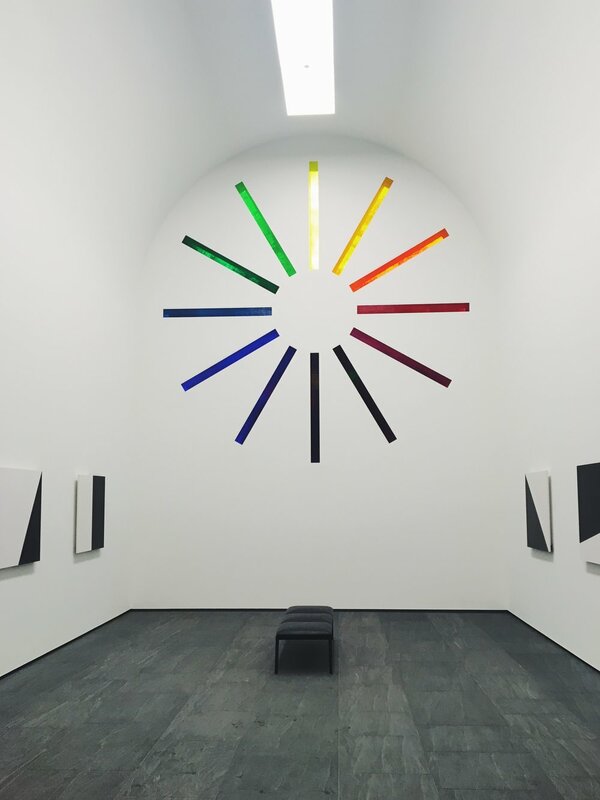 Instead, the fam and I flew into Austin for convenience and to knock off an age old bucket list item of mine: visit the Ellsworth Kelly Chapel at the Blanton Museum of Art. Despite the dreary, grey, rainy day, the Chapel enchanted all of us with its magnetic color spectrum and all around cleansing energy. Built as a fairly secular space, as Kelly himself was not particularly religious, this stop was the perfect prelude for a rejuvenating trip to close out 2018. Once I soaked up as many colors as I could, we loaded into the car for the 6+ hour stretch ahead of us - Opa’s Sausage sandwich in hand. 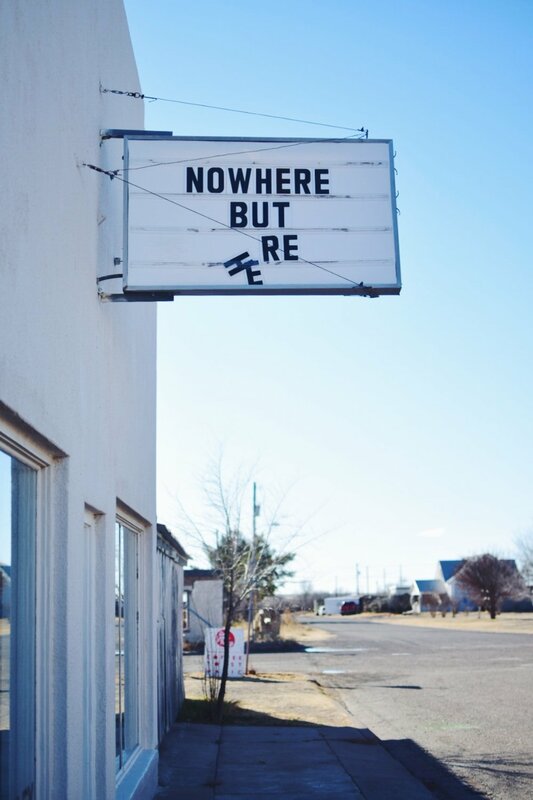 Marfa, Texas, as I mentioned, is very small. 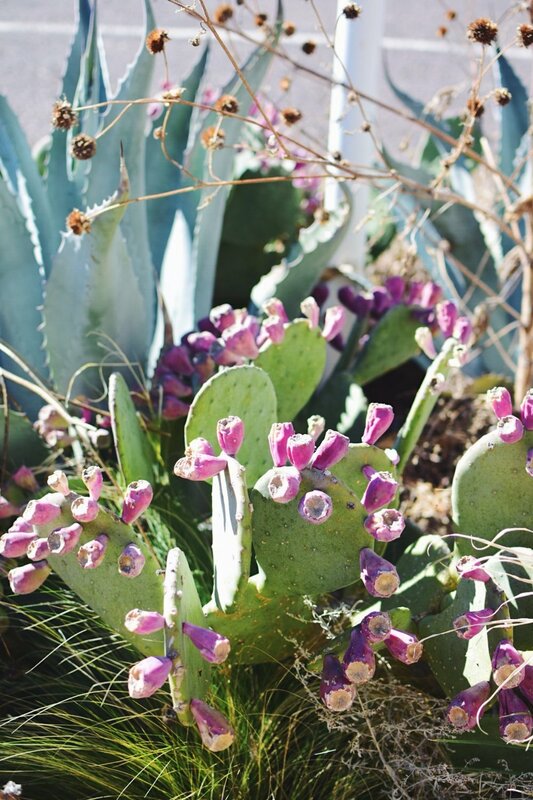 In fact, the concierge at one of the hotels described it as “teeny tiny.” What Marfa lacked in visitor hospitality, it more than made up for in quirks and crannies. Every corner of said 3 block town was jam packed with tchotchkes, galleries, nouveau restaurants, and the same 25 people we saw at every moment of the day. The only way to escape cabin fever? Drive another 30 mins outside the town center to the Prada Pop-Up on the side of the highway. 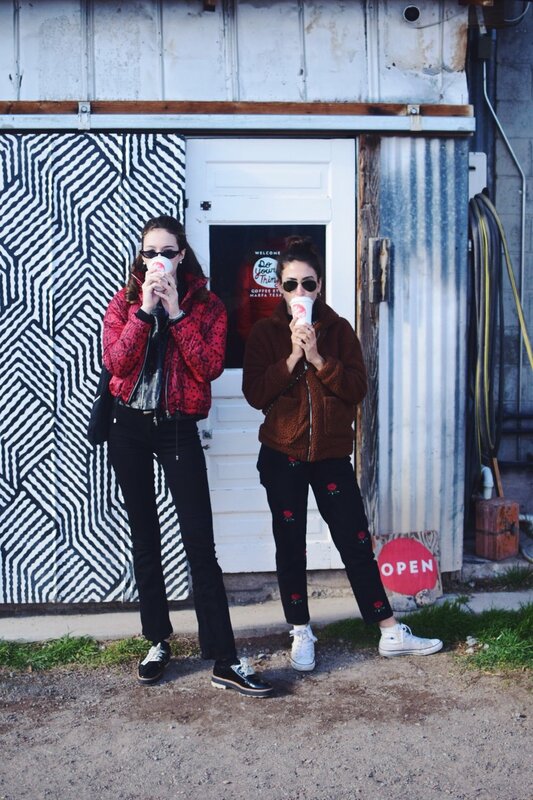 While it has many fooled into thinking it’s an actual store, Prada Marfa is in fact solely an art installation - meant to tantalize Instagram followers and eventually biodegrade back into the earth. 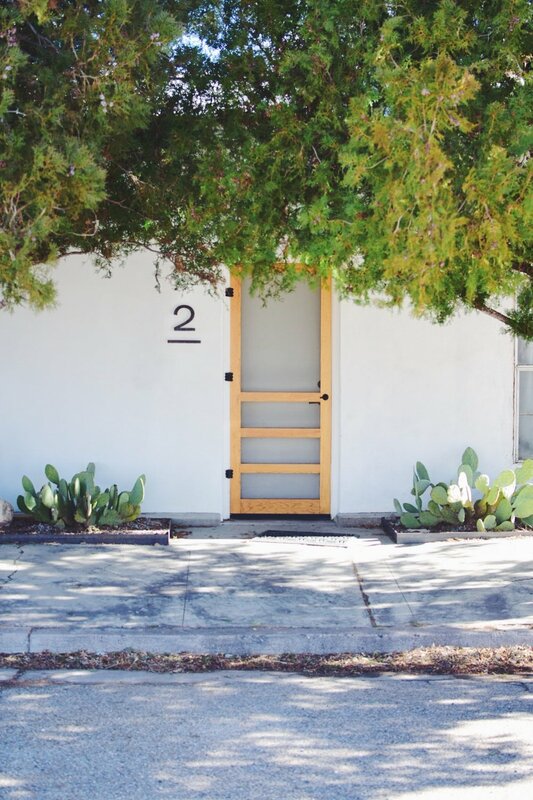 In terms of ~art~ Marfa is actually quite well known for its relationship with the artist Donald Judd. 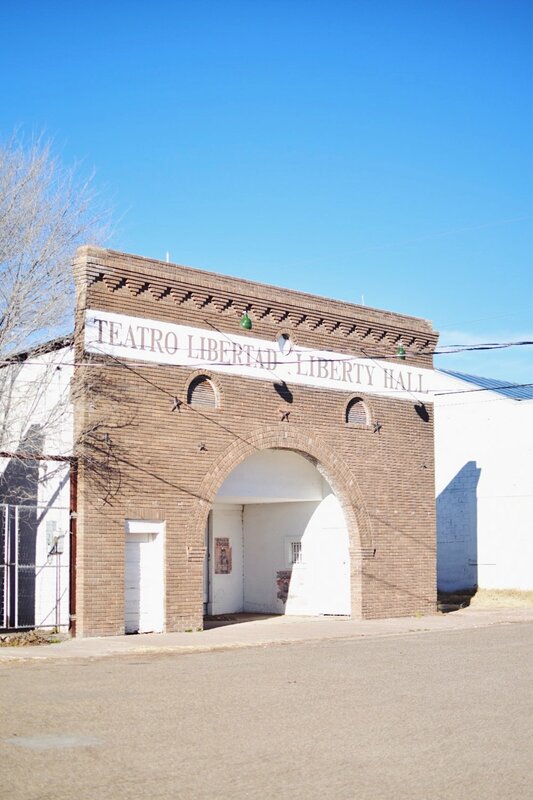 While people might say Judd put Marfa on the map, townsfolk vehemently standby that Marfa existed well before then (which it did, but how many people knew about it…?) 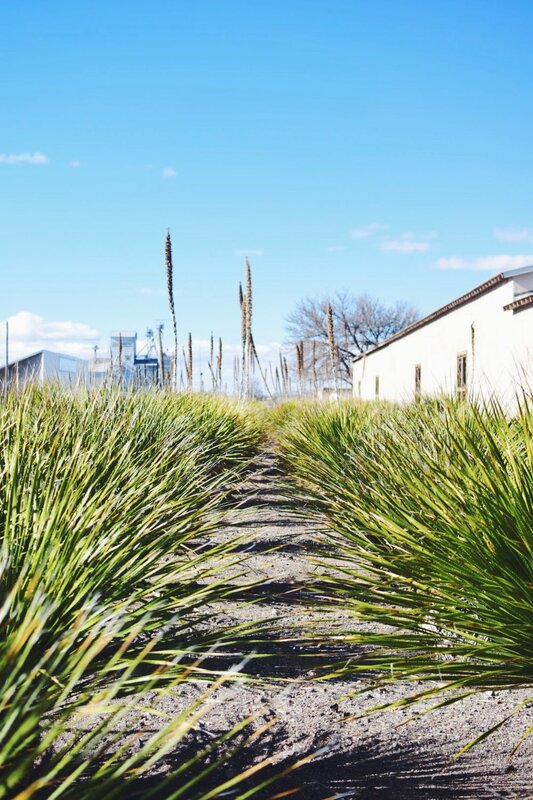 The crowning jewel of Marfa x Judd is The Chinati Foundation - which we purposefully saved for the last day of our trip in order to have something to look forward to each day. 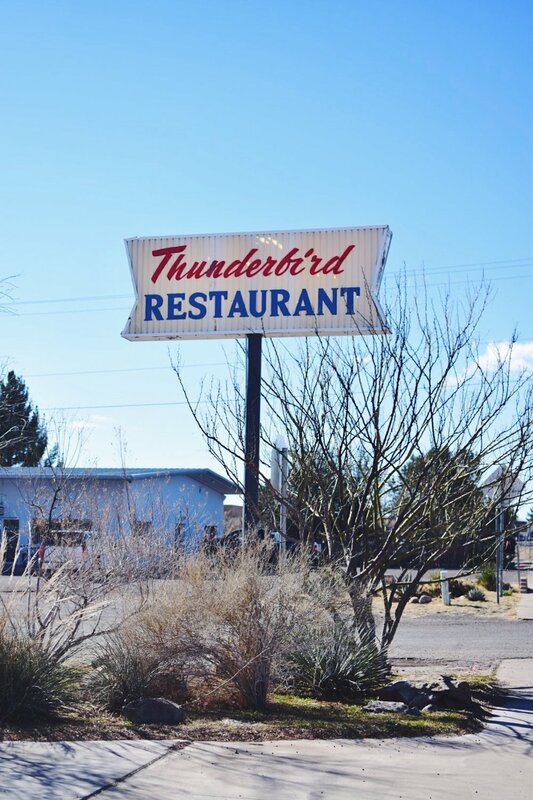 Pro tip: make a reservation in advance. Don’t get turned away at the door like we did. Don’t take pictures through the window like we did, you’ll get chased. 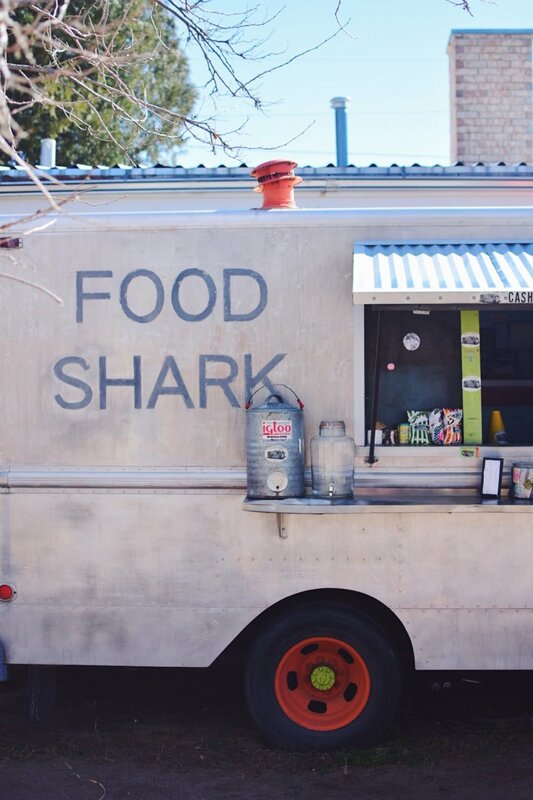 Other culinary highlights in this “teeny tiny” town included the famed Marfa Burrito - well worth the hype. 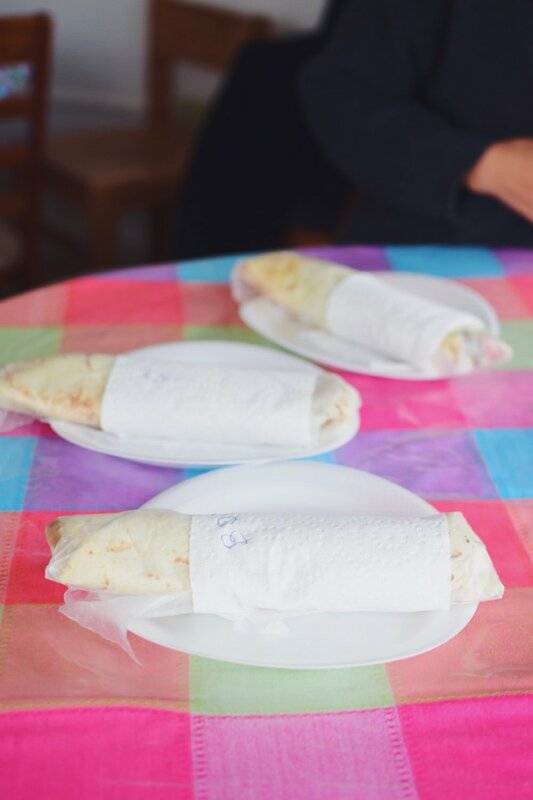 If you’re headed to Stellina, make sure to arrive at 5pm for dinner (that’s when it opens and it’ll be full by 5:05pm). And don’t be afraid to make friends with your seat mates. As I said, the town is small and you’ll be running in the same circles as everyone. 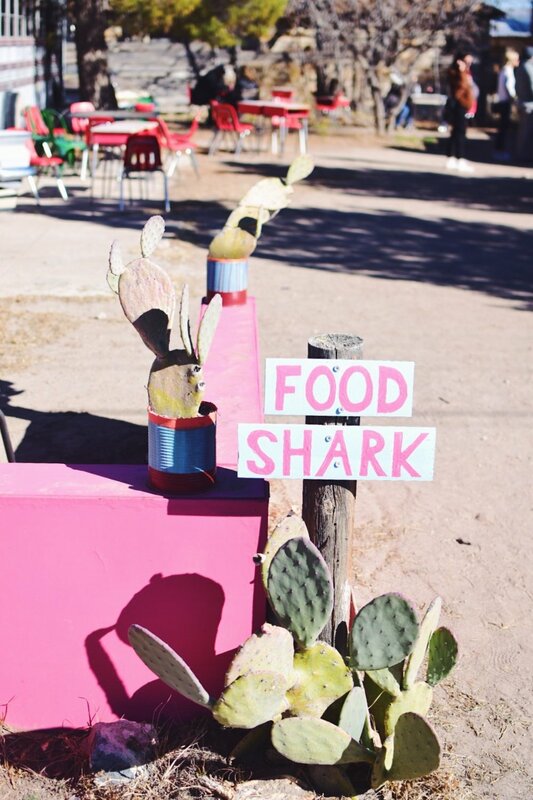 In fact you might even run into them in the communal showers at El Cosmico! 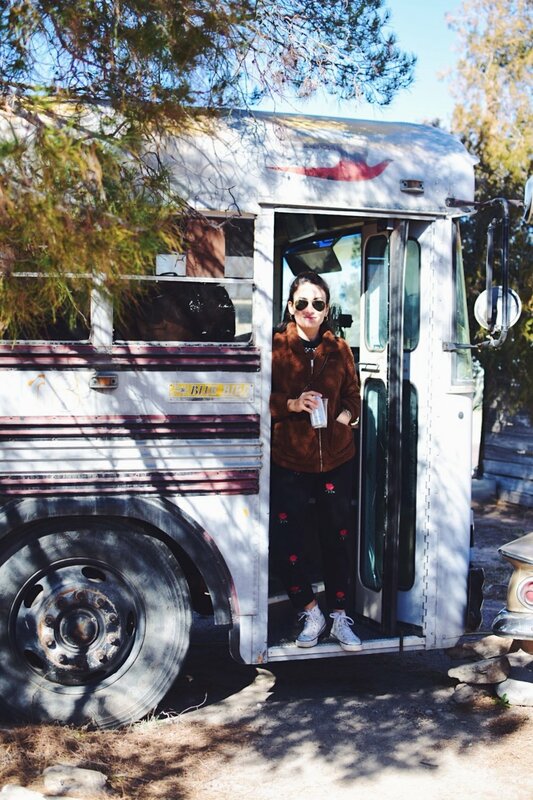 All in all, Marfa was everything we anticipated, and then some. 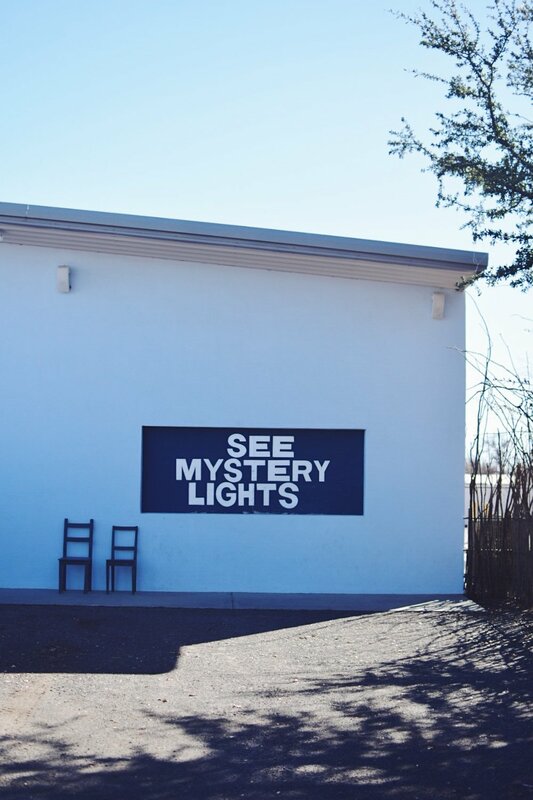 If you’re in the mood for a remote recharge complete with good eats, pleasing sights, and a touch of unpredictability, Marfa’s the place! Given its small stature and the limited things to do once you realize you don’t have a reservation at The Chinati Foundation, I’d say you could comfortably see the sights in ~2days. That is, if you save a separate day (and blogpost) for Big Bend. Moral of the story? 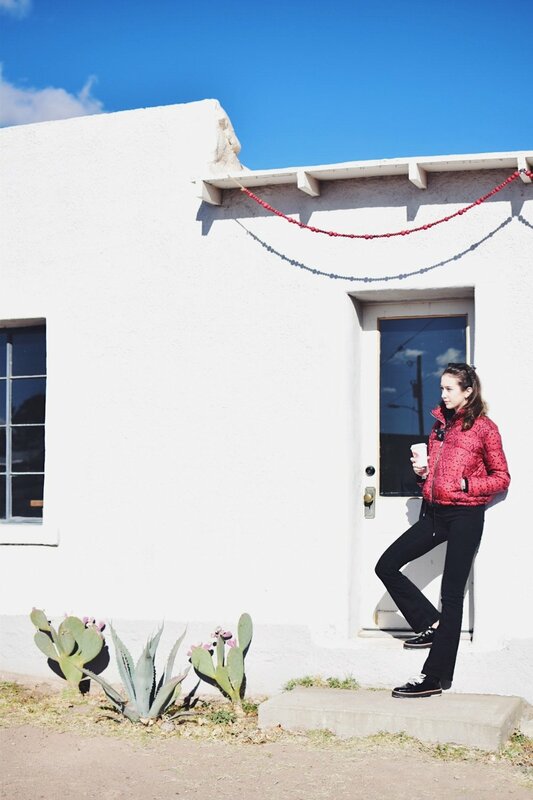 Treat Yurtself and check out Marfa, Texas. You won’t regret it or forget it. The Harvard Art Museums, affectionately referred to as “HAM”, places students at the forefront. From affording them research and work opportunities, to hosting lectures of all subjects in the museum, to allowing us to use the Art Study Center to sit alone with original works of art, HAM truly operates with students at the helm. As a member of HAM’s Student Board, I have had the great fortune of hearing from different museum faculty about their work within the museum and how, often times, students can get involved. During one particular meeting last Spring, Laura Muir (Research Curator for Academic and Public Programs) spoke to us about the University Teaching Gallery: a space for Harvard courses to select objects from the museum to accompany their syllabus and encourage students to apply what they’re learning in class to objects that they encounter outside the classroom. In concluding this discussion, Laura mentioned she was in the process of selecting the courses to participate in this gallery for the Fall semester. Since I’ve always been curious about how exhibitions are put together (everything from the narrative arc to the politics of acquiring desired pieces), I jumped at the opportunity to get involved. I immediately thought of working with my Neuroaesthetics Professor, Dr. Nancy Etcoff, to propose objects that would add a visual element to her already robust course design. In looking at the course syllabus and teasing out the topics that would benefit most from visual counterparts, we structured the 9 objects in the exhibit to follow the themes of The Face / Gaze, What is Beauty / Art, Synesthesia / The Sublime, Longing / Melancholy, and The Uncanny. For this portion, we were inspired by studies we’d read in the course that discussed how people perceive others’ affects based on how we interpret their gaze. In one particular study, it was explained that a portrait of a man was perceived as affable when told the man was looking at a scene of a family, but his look instantly became lecherous when told he was gazing at a swimsuit model. With this disparity, we want viewers to wonder about the affect of these sitters, and, how (if at all) that changes when positioned looking at I’m With Stupid (info below) in the gallery space. What is Beauty / Art? The course opens with a discussion about what is art and what is beauty. Can tools be aesthetic objects? And, if so, why? These two objects meld functionality and ornamentation. The left dagger doubling as protective, yet decorative, arm wear, and the right flask being designed to emulate the body of a fish. The latter example even ties in with the current special exhibition on view in the museum, Animal Shaped Vessels! When people hear of “neuroaesthetics” the topic of synesthesia often comes to mind as it’s neurological cross-wiring has had well documented impact on the arts. Think Kandinsky and his desire to visualize music. While, there wasn’t a perfect example of Kandinsky to pull for the exhibition, we turned to Whistler and his similar motivation to combine music and visual art. Similar to the awe-inspiring underpinnings of synesthesia, the concept of the sublime comes into neuroaesthetics as being an extreme example of sensory overload. 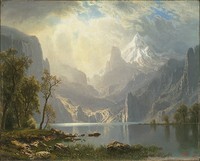 Here, we chose a classic, sublime landscape example by Bierstadt. 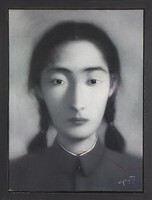 Depictions of sad affects are often the most easily recognizable for viewers, as the somber tone quickly resonates with past emotional experiences. For this phenomenon, we chose two depictions of melancholy and positioned them to be looking at one another. The left figure leaning more towards the realm of longing, and the right figure being a personification of melancholy herself. My favorite inclusion in the exhibit has to be I’m With Stupid, as it challenges viewers to think about almost all of the above categories. Is it art? Or just a mishmash of cacophonous objects? What are the faces telling you? Can you even see them, or are they even human faces? Does it tantalize your senses? How so? And, ultimately, who is the ‘stupid’ that the title refers to? One of the two figures, or you? For a museum who prioritizes student engagement and involvement, co-curating this exhibit had to be one of my favorite experiences here and best manifestations of the museum’s mission. I even talk a little bit about the experience in an article about another great museum moment: The Student Late Night. Moral of the story: if you’re curious about something, go after it. Especially here at Harvard, a playground I’m fortunate to have access to, the resources are what you make of them. A trip to the latest Color Factory show in NYC calls for digging up my sister’s old Middle School era dress because it is a twirl-able rainbow incarnate. Dressed in the visible color spectrum and fully funded by my gracious department of History of Art & Architecture, I was ready to take in what this new iteration of The Color Factory had to offer - camera and notes in hand. As I begin to fine tune the scope of my thesis, a project which I have spent years amassing color-related content for, I realize that part of what I want to tap into is the reason behind art’s newfound color craze. Specifically, how intrinsic qualities of color lend themselves to depicting ephemeral experiences in ways that other mediums cannot. What I found in NYC was just that. This version of The Color Factory focused on attendee’s relationships to each other and to themselves, using color as the catalyst. After entering through a rainbow tunnel reminiscent of the ribbon wall at Color Factory’s SF show, we were greeted with the most visually pleasing welcome video ever to grace my eyes. Once registering and picking up a sparkling macaron for the road ahead, we all entered through a tunnel boasting walls of buttons that directed us to select the color that most resonated with us. Naturally I chose a dusty rose button and joked that this tunnel visualized what I think my brain looks like. On the other side, we were split up into two groups and funneled into a parlor room where we were seated across from someone and guided through a series of activities through coordinated audio. The premise of this room was to compliment. Sitting in complementary colors, my partner Alana and I were instructed to select colors that represented each other. 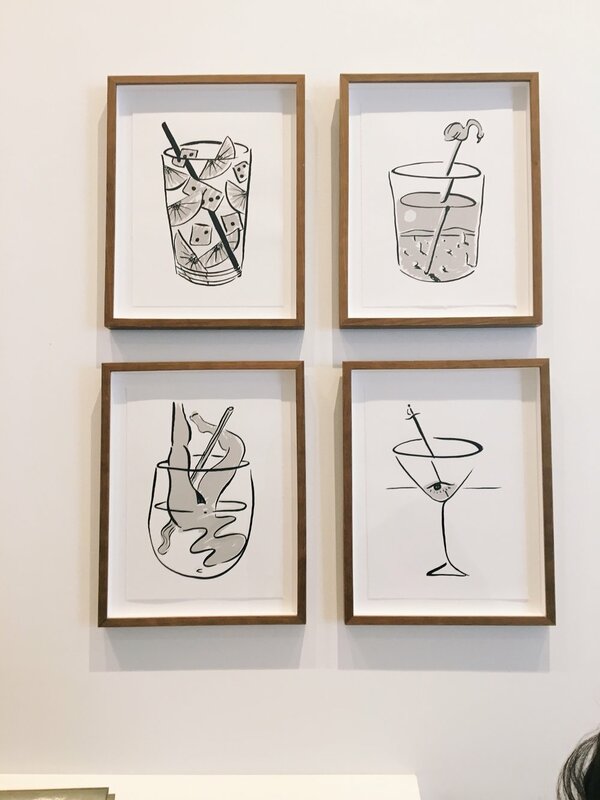 We also had to do a contour drawing without breaking eye contact with one another, and then were treated with complementary, complementary candies tastefully chosen to pair well with each other. Next up was a sound experience room where we each played notes from complimentary keys. Post the twinkling of our eardrums, we entered a room bathed in sunset and filled with balloons with wishes written on them. Trying to snag a photo in this room was like battling with a windstorm, and we ended up getting a handful of Magritte-esque Son of Man portraits. Exiting the sunset room led us to a roadmap of personality questions that ultimately deposited us at the door of our individual, secret color. Each room was grouped by hue, and afterwards we were directed to take a paint-chip style memento of our secret color, complete with a cue for the next room: a disco fever themed dance floor - where we could strike a pose based on the suggestion written on our secret color card. For an educational interlude, there was a hallway with alphabetically organized vertical drawers that featured pigments and their color histories. Unsurprisingly, this room was created by Kassia St. Clair, author of The Secret Lives of Color - one of the many titles decorating my bookshelf and on the list of potential thesis sources in my never ending bibliography spreadsheet. In a similar vein, the next room presented us with pie charts of NYC stats, displayed in spin-able and boomerang-able benches. Last up, similar to the SF show, was a wall to wall ball pit filled with the most soothing shade of blue. This was the point where my friends and I paused our analytical note-taking and just felt like kids again. And with that, the magic of The Color Factory was concluded, though the tingling feeling of being surrounded by such a happy collection of hues will provide the joy and motivation to carry me through the monochromatic winter months ahead. I often dream about owning my own little one room shop when I grow up. It'd be filled with one stock items so that everyone who came through and shopped would know that what they found was uniquely theirs. Maybe I'd sell objects of one color, and change that color every month. Whatever the concept, I know that finally financing a purpose for all the quirky tchotchkes and eclectic tastes I have will make me smile. Trotting around NYC this summer, I'm often looking for those little, eye-lifting moments that make me smile. It's curious what I'm drawn to, and because of it's aesthetic inconsistency, I can't help but wonder: what would I look like if I were a New York City Storefront? On a summer's Sunday morning, what else could be more fitting for some than going to Church? In our case, a party of three (with two of us being Jewish) decided to go to the Church of fashion: The Heavenly Bodies Exhibit at The Met. 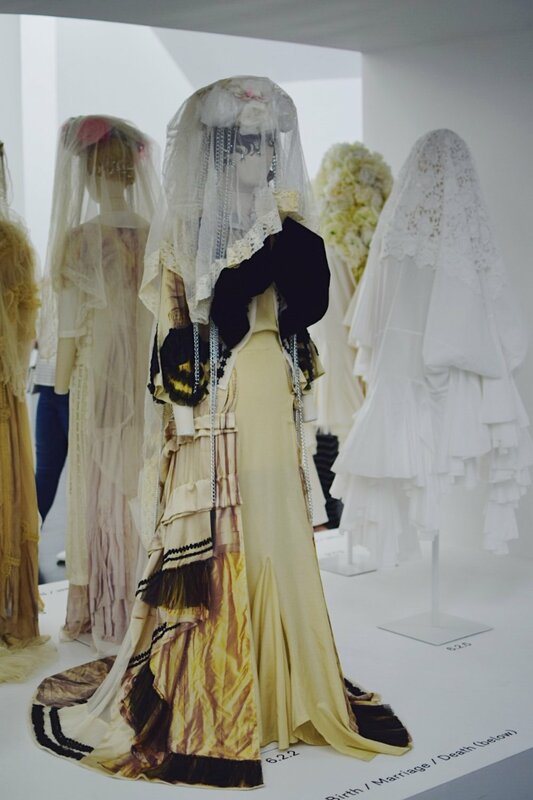 Hyped up from all the Met Gala videos of star studded guests strutted through the galleries and donning designs by many of the designers prominently displayed in this religious retrospective, Annie, Rebecca, and I put on our Sunday best and embarked on our religious experience. When you walk in, one of the first things you'll notice are the purposeful shadows and spots of light. The whole presentation has not only been carefully curated for content, but for ambiance as well. The music on loop in the background mesmerizes you. It perfectly matches the sense of drama mirrored in the costumes and staging of the exhibit. Luckily, Annie got in trouble for Shazaming the soundtrack so you don't have to. Find a similar tune here, and I strongly recommend playing it while you continue this read. The exhibit was split in two spots at The Met (not to mention offsite displays as well): the Anna Wintour Costume Institute & the Medieval and Byzantine Art Galleries. The former featured relics and items from the Vatican in the costume institute underground in order to set the historical tone of the more theatrical display aboveground. And, aboveground, fantasy melted into fact as garments by Versace to Alexander McQueen were interspersed with art from The Met's permanent collection of Medieval and Byzantine Art. 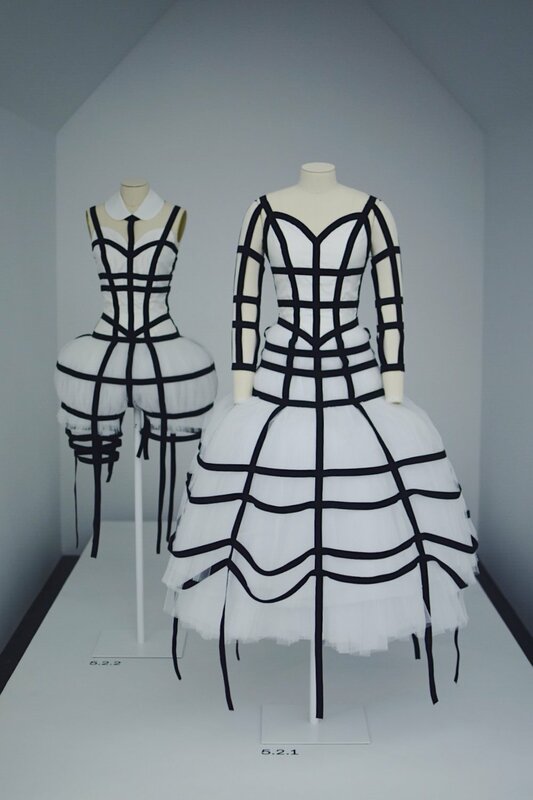 This split of displays was a helpful, visual delineation - if not a good excuse to cross the entirety of The MET in between - prompting Annie to point out the juxtaposition of, "old garments in a modern space and modern garments in an old space." And a modern space indeed. 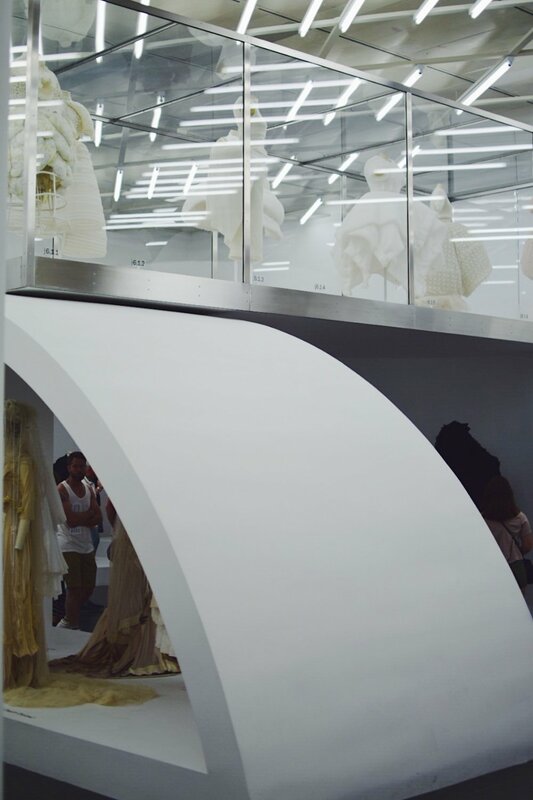 The first few dresses were floated atop stands in parallel hallways that led into the main gallery space. The mannequins looked like they were strutting on a runway in heaven as we had to crane our necks and catch glimpses in between spotlights to see them in all their glory. In between these two hallways were the brightest gems of the exhibit: three Versace tops encrusted with jovially colored jewels, presented against exposed bricks and encased relics. Gliding onto the main gallery, you can't help but start to feel a bewitching quality consume you. All the mannequins stand eyes closed, draped in ornate and opulent fabrics. They're positioned either in flanks, in silos, or watching you from above. Everywhere you turn there's a new garment beckoning you with it's rich colors or even richer jewels. And each time you lean in close to inspect the details, you're sucked into another world of fashion. Each designer showcased in this exhibit is or was Catholic, and are all brought together here by their sartorial storytelling abilities. Piecing together garments that manifest "the Catholic imagination" as stated by sociologist Andrew Greeley - the theoretical backbone to the exhibit. 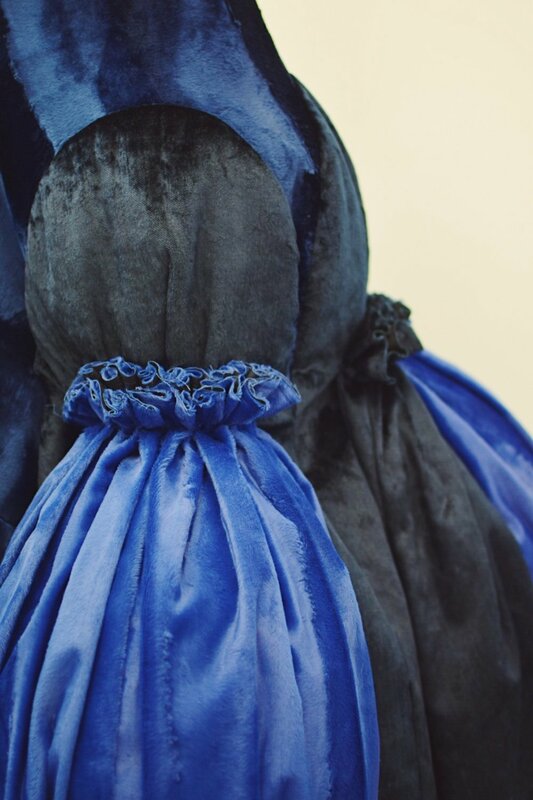 Each cluster of costumes represents a short story (like The Habit) and crescendos into an overall narrative of how fashion stems from function and evolves into fantasy. Inside Raquel's Dream House, "less is bore"
Post the summer move to NYC, I found myself resting in the bed of my new apartment sublet: head pressed against the back wall and feet touching the opposing wall. My room is cozy, to say it sweetly, and after two days of experiencing New York living for myself, I decided to restore my faith in ample square footage and visit a popular SoHo Pop-Up exhibit: Raquel's Dream House on 79 Greene St. Arriving promptly at 11am (anticipating a line around the block since Gigi Hadid visited the day prior and the exhibit was closing soon after), I was met with an empty, 3 story apartment display all to myself. What kind of room is possible? An adventure of mixed tenses and reconciled opposites, Raquel’s Dream House coheres in the materia prima of design. Design conceived as an alchemical vocabulary for working and inhabiting. A room as a way of seeing. The first floor operated more like a gallery display, with art populating the walls and decorative Daniel Buren pillars presenting an "Urban Light" LACMA-esque photo-op. Heading upstairs on the colorfully painted stairs had to be my highlight (typical), pre-selfie in the groovily pink mirror. Come to think of it, there were many mirrors speckled about the space. 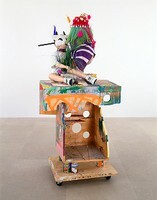 Many of the rooms put together funky seating with even funkier art objects. Think fuzzy wall hangings, life-sized pictures of interiors, and the most beautiful designed piece that really puts the ~table~ in table tennis. The space attracted a lot of light - whether pouring in the higher the floor or concocted by quirky, artificial fixtures. I found myself pulled towards these rooms and pieces in particular, probably because colorful things have a magical magnetism on me. While there was "seating" aplenty, this was more of a visual dream house than a livable one. This house had it all: from meta-interior decoration to man caves. To keep myself from nestling into the couches and never leaving, I decided to devour the space with my camera instead. And if you wanted to take away more than just photos of furniture, there was a little tchotchke sectioned that rivaled the famed gift shops of art museums everywhere! In a city known for it's cramped and crumbling quarters, it was quite refreshing to explore this sprawling architectural playground. It's almost summer time here in Cambridge, and the weather has finally started to realize that: the sun screams "shorts weather!" and the trees are all blossoming with a rainbow palette of hues. Suffice it to say, I'm a summer person, and not just because most of the clothing I own from Miami is made of linen. I love this time of year because the outdoors feel inspiring; like an endless field of adventures and creative pursuits that you can finally tackle now that school is over. Not to mention all the colors that catch your eye while you're walking around, now that it's finally warm enough to do so. It's no coincidence, then, that The Practice Space, "a storefront for art, design, and research," is all about color this time of year. Last Thursday, they hosted a workshop called, "Practicing Color, Practicing Material." And, given that I just turned in my thesis proposal and declared that the argument will be focused on color theory, it's no surprise that a professor in my department suggested I attend this workshop. Curiously, this storefront was also mentioned to me in an email exchange with Leah Rosenberg, a woman I had spoke with about her work with The Color Factory, some time ago. So my guidance to head to this workshop manifested twofold, and I promptly bought myself a ticket. Then I bought another, because who doesn't like a buddy? And then I received an email that I was the only person who had purchased tickets... The workshop soon turned into a romantic date night for two, with exclusive access to Nicole, co-founder of the space, who spoke excitedly with me about color. Artists of all mediums - shake up your practice with some social art making and color play! This workshop begins with a short grounding activity, either walking or still, as a way of letting go and entering into a space of experimentation. Then, using paint, ink, sticks, palette knives, and brushes we engage in mark making and color mixing from various prompts. Our focus is on process and the experience of experimentation, rather than making a perfect finished product. You may even find your color mixing palette is the favorite thing you produce. We began with said grounding activity: drawing an infinity loop with a pencil and allowing the mesmerizing motion to dull our daily lives. With each swoosh of the pencil, I felt like my mind was freeing of all its to-do lists and stresses, and opening up to feeling truly in the moment. After that activity, the three of us went on a color walk to focus on colors that stood out to us. The colors we remembered the most were hues we'd try to re-create in the studio using watercolors. Personally, I was instantly intrigued by a citrine-leafed tree we passed because it reminded me of all the glistening slices of spring that had sprouted up around campus. When we got back to the studio, we all practiced our color mixing on a shared sheet, and then transferred our favorite, "most accurate seeming" color onto a little card, for color matching another day. The whole activity of thinking about a color and re-creating it yourself, made me realize that memories are made and kept in so many different ways. Like when I was mixing reds and blues and whites to create a soft lilac, I stumbled upon a pinker mixture that instantly reminded me of my Bat Mitzvah invitations from way back when. It was comforting to me that I could access such a fond memory with simple brush strokes and dabs of water. At the end of the workshop, we left with open minds, happy hearts, and paint covered hands. I couldn't have imagined a more meditative way to capture the joy that spring and summer bring me. So thank you Nicole and The Practice Space for allowing me to explore, with my own hands, what color can do. Going to school in Cambridge, MA means I'm extremely close to Portland, ME - a quaint area known for a burgeoning art scene and the ease of weekend trip-ability. This past Saturday, courtesy of the Harvard Art Museums Student Board & Student Guide program, my friends and I took a bus to check out all the fuss for ourselves. Given that the semester is coming to a close and that senior spring nostalgia is hitting (despite the fact that I'm a junior and fully have another school year ahead of me), escaping campus provided unexpected relief from some self-imposed woes. It took exploring the Portland Museum of Art to make me feel at home, in a city I had never visited before. And to catalyze that comfort, I have Joan Miró to thank. After scoping out the Biennial Show in which I found photographs by John Harlow who spliced his imagery with his wife's journal entries, Anne Buckwater's innovative mounting method for her paper works, and Becca Albee's intriguing commentary on feminist literature by condensing her annotations per chapter on one page, I peeled away from my peers and travelled upstairs. Seeking fresh air and a moment of silence, I found myself face to face with a time machine. No, not actually. But I stumbled upon a Miró I had never seen before. But the gestural and jovial marks familiar to this artist transported me to my grandmother's apartment circa 2003. I'm sitting in her kitchenette eating turkey and butter sandwiches on challah rolls, and laughing at something my sister said that my grandmother must not have found as amusing. While I'm no longer 6 years old nor in my grandmother's Miami Beach apartment, standing in front of this Miró provided me a momentary glimpse into my past. This is what I love about art: it's ability to transport and to resonate. Art has a way of making you feel something, and allowing you to see in abstraction what you're looking for. And what I was looking for, in that moment, was comfort. And comfort I found in this untitled "chickadee" looking work. In another room on a different floor, I encountered a corner that instantly made me smile. Perhaps it was the brighter colors to contrast my somber mood, but I also found it shocking that the painting that most moved me was another Miró. This one, entitled The First Spark of Day III simply made me happy. And having it juxtaposed with Adolph Gottlieb's Green Ground created an instant happy place (or corner, at that) for me in the museum. So I'd say that the two hour bus ride to Portland was well worth it, given that it brought me instantly closer to home - and that trip is usually a 3 hour flight. The Harvard Art Museums Student Board & Student Guide Program, 2018. Courtesy of @harvardarthappens. How Emotionally Resonant are Rothko's, Really? If you know me (or have kept up with recent posts), you know how intrigued I am by color. So much so, I'm probably writing my senior thesis about it. I'm particularly curious about how different uses of color in art can accelerate emotional connectivity and convey artist's messages in a more experiential way. As an intangible element of art, color has several characteristics that come into play when discussing how it affects viewers. Unlike some other more upbeat and whimsical employments of color, Mark Rothko explores the darker side of color's capabilities. "Darker” not only represents the harsher tones and somber affect present in the works of Mark Rothko, but also how the content dealt with in his work tends to be heavier, his execution more rough and visceral, and his desired message to convey is more desperate. Mark Rothko was an Abstract Expressionist working in the 1940’s-70’s, painting massive color field canvases to expel the tension and despair he dealt with throughout his life. After being diagnosed with a mild aortic aneurysm, Rothko began using materials that reflected the instability of his condition. 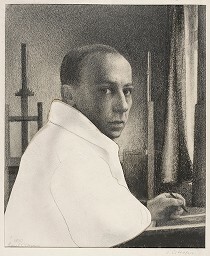 Therefore, his paintings tend to degrade at a quick rate, and have been subjected to various conservation techniques; most excitingly that of the Harvard Art Museums in 2015 who projected corrective light on the canvas to restore their original appearance. Looking at several of his canvases on display at the MFA, it’s interesting to pick apart the elements of his works that contribute to the particular feeling of experiencing them in person. Taking into consideration materials, size, and color palette, we can begin to understand what’s at play in a Rothko painting. Rothko himself described his works as transcendent. Evidenced in No.9 (1948), a more jovial painting in color scheme, the colors act an actionable agents. This canvas depicts movement and the vibration of layered swatches. The colors, here, pulsate, perhaps due to the technique of watering down some of his pigments to allow for transparency in layering. In Untitled (1949), Rothko starts to move towards a darker palette familiar to his “classic style.” Here, the colors struck me more personally, instantly eliciting a nostalgic memory of eating rainbow cookies in my childhood. Thus, the canvas managed to depict the colors of my heritage and helped me connect in an overtly symbolic manner. By No.1 (1961), Rothko employed darker colors described in the wall text as, “the artist contrasts two muted green rectangles with a third, smaller shape of fiery red, all set against a somber maroon ground.” (MFA Wall Text) Notice how the descriptors of the colors are all emotive: "muted," "fiery," "somber." Here, more so than in any of the other works on display, Rothko forces viewers to immerse themselves in close looking - for with just a cursory glance, they might miss the subtle differences in the black paints used. In my brief time at the MFA, I was able to witness, firsthand, how people’s experiences of Rothko’s differ. Some people scrutinize with close looking. Some people sit and contemplate. And some people stand, get consumed by the canvas, and cry. The emotions of the viewer, thus mirror the emotions imbued in the canvas - in Rothko’s case, with color. For the third and final show of Color Rx: Humanoid, we decided to do something a little different. Something a little more experiential. And something a lot more tasty. Visitors walked in and encountered me, fully clad in a lab coat (thanks MCB Department! ), sitting at a prescription counter reminiscent of pharmacy windows. Each person was asked to write down how they were feeling on an index card. I would then correlate their sentiment to a prescriptive color, and change the light color in the space to reflect their result. After visitors were treated and treated, they were free to roam about the space and soak in the light show, view the polaroid photo display of past visitors, and write down their colored thoughts in the journal by the static glass display. All in all, the Late Night allowed for more mingling, discussing, and basking in color, light, and good vibes. So thank you to everyone who rolled on through and here's hoping that you left with a colorful pick me up! Special thanks to my helper for the night, Sofia, who probably said "Here's the sangria, it's flirty, it's fruity, it's sensual" a good 45 times over the course of the evening. And, of course, a huge thanks to Essa Lucienne for hosting this three-run-show in her gorgeous exhibition space, assembling the magical hallway light fixtures, and for being an absolute visionary. 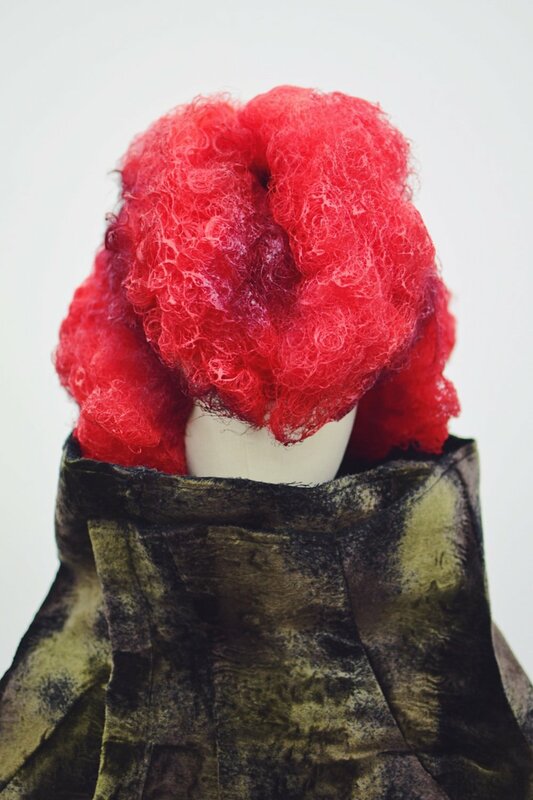 For the past three weekends in February, Color Rx (a summer research project turned campus-wide hot spot, and even pop up feature at the Rainbow Unicorn Gallery in Berlin, Germany) has been up, available, and poppin' at Vessel Gallery on 6 Linden St. Vessel Gallery at Harvard University is housed in Linden Street Studios in Cambridge. 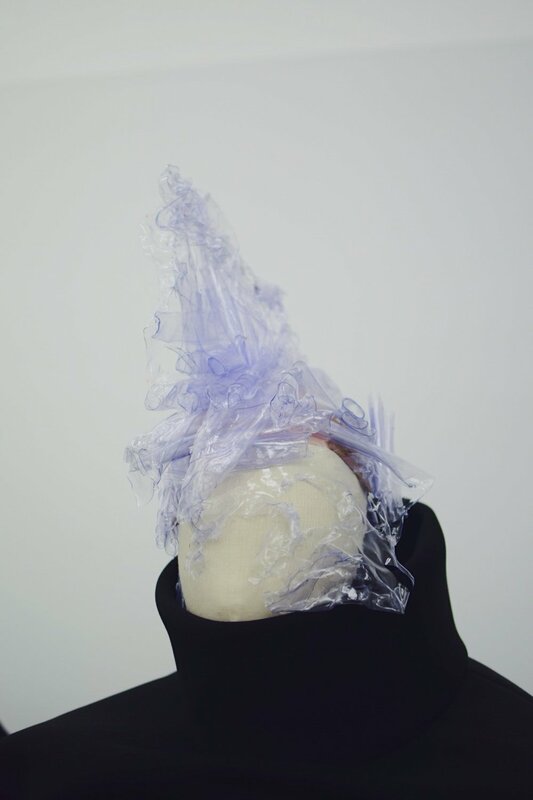 As an exhibition/film-screening/gathering space, it hosts works by artists from the Department of Visual and Environmental Studies and talents of the undergraduate community. For this iteration of Color Rx, I sought to ~unveil the algorithm~. How so? By involving human helpers to run through the motions of the algorithm, enacting moments like string parsing and keyword identifying, two integral parts of the computer algorithm used in the first showing of Color Rx in the Harvard Art Museums. This pop-up installation was set up to mirror a doctor's appointment - well, a painless one at that. Visitors were invited to book appointments online in advance, and head to the space during open hours on a given Saturday. 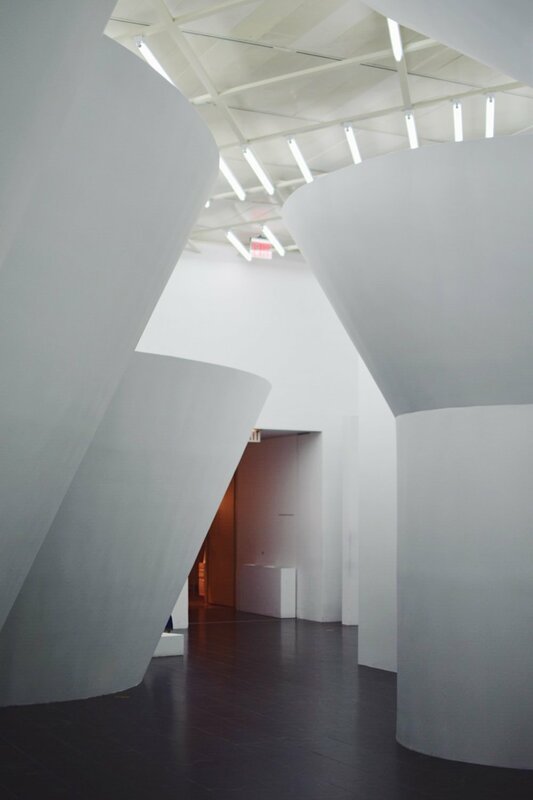 Upon entering the gallery and viewing the static installation upstairs, visitors descended the back steps into a dimly lit, white room, meant to reflect the emptiness and sterility of a computer's "brain." As visitors approached the "receptionist," they were asked to write down how they were feeling in a sentence. This sentiment was then transcribed onto separate post its, allowing the second helper to manually "parse the string" in order to detect salient words that would reflect the sentiment of the sentence. Words like nervous, stressed, and excited were some of the more popular sentiments elicited, though the inputs varied. With the words the second helper selected, I tried to prescribe colors that I felt would best supplement the visitor's mood. Upon deciding the hue for you, the space lit up in that color (as if reflecting an aha moment by Bluetooth magic), and I hand delivered a paint chip prescription. Color is ephemeral and complex. Color Rx contends with the individuality of perception, while maintaining that the experiences in which perceptions are grounded can be traced back to, and tethered together by, a common, colorful trend. Drawing inspiration from previous iterations of the project, scholarly texts, and the artist’s knowledge and intuition, the piece explores lines between truth and belief, color and illusion. And yet its prescriptions, unconventional and mysterious though they may be, make connections and produce impacts in the world. Color Rx: humanoid simulates the computer algorithm originally used to diagnose a viewer’s inputs and “prescribe a color” in response. The piece is grounded in questions about trust in, or benefit from, “smart” systems, often in contexts where the algorithms are opaque – even when the output is very concrete. What does it mean for machines or systems to drive our behavior?Can we adequately assess the benefits and risks? 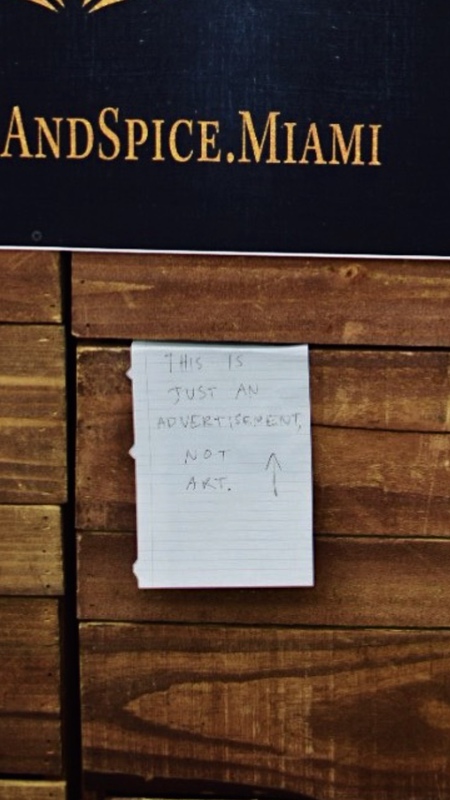 The major takeaway from this pop-up installation? Colors lift spirits, and people are very game to buy into an experiential gimmick in today's digital/instagrammable age. Special thanks to Essa Lucienne, the beautiful brains behind Vessel Gallery, and to my four helpers Caroline, Annie, Russell, and Kyle, for helping me to manifest this artistic vision. My dad, Mo, loves ice cream. That's no secret. It's actually become part of his "brand" - as has the moniker "Mo" become his internet stage name, replacing the more official "Mauricio" he was born with. Mo is the kinda guy who can walk into an ice cream place and order the most absurd combo of flavors and you’ll be like “butter pecan and mint? that’s disgusting” and you're wrong because not once has he come up with a gross concoction. No. The man is an ice cream ~savant~. He finagles the most delicious fusions. It’s a gift - but, if we're being honest, he’s also lactose intolerant. So it’s more like a blessing and a curse. Since Mo loves ice cream (even if ice cream doesn't love him), I figured a trip to Miami's Pop Up of The Museum of Ice Cream would be like taking a kid to a candy store *quite literally*. First off, Mo made sure to wear his "pistachio pants:" these glaringly aqua bottoms that he also owns a matching polo for, though I told him to tone it down for this instagrammable adventure. Stepping right up to the building on Collins, I couldn't be more eager for this winter break treat - especially since I heard you actually received a treat in every room. When I tell you we all left with cavities and full stomachs - I'm serious. We went at 12pm and didn't eat again until 8pm. The very pink lobby of the museum foreshadowed what was to come: facts, fortunes, fun, and fuchsia. After receiving a "fortune" from Fortune Teller "Café con Leche" (of which my dad got "cherries"), we were ushered into the Sprinkle Pool - which did not pique the interest of my adult father, so I took the plunge instead. The sprinkles are made of plastic, so luckily they don't melt on your clothing, but they do get stuck in between your toes and in the spandex I wore underneath my skirt. "SPRINKLE POOL is a reminder that when you believe in the power of imagination, anything is possible. Inspired by Museum of Ice Cream's Founder & Creative Director Maryellis Bunn's childhood dream, SPRINKLE POOL represents the magic of an everlasting dream realized." "BUNNS SHAKE is an homage to a beloved dining institution and a throwback to 1950s Americans. Celebrating our inexplicable feeling of delight when we enter a classic diner, BUNNS SHAKE reminds us of the beauty of genuine nostalgia and memory." Next up, we entered a room with life-sized ice cream cone fans, and were instructed to learn the "Ice Cream Dance." Mind you, when you teach two twenty year olds and a sixty four year old the same dance, it's going to look verrrry different. I am proud to say, though, that Mo was indeed able to drop it low for the big finish. Post mini dance workout, we got to snack on frozen bananas and swing on life-sized fruit. Peep the huge grin on Mo's face here, leading me to believe that (aside from the day I was born) this must've been the happiest day of Mo's life. Next up was the "Melted" station where we were given actual cartons of melted vanilla ice cream. "A play on the sizzling heat of Miami Beach, MELTED takes you to your favorite ice cream shop frozen in time. We invite you to slow down and savor your most cherished treat reimagined." "SANDCASTLE DREAMS challenges our understanding of "adulthood" by evoking the childhood memory of playing in the sand. Like ice cream, our most treasured treat, sandcastles stir up nostalgia for our most beloved childhood seaside memories. Toying with size, scale, and depth, SANDCASTLE DREAMS urges you to create, engage, and unleash the childlike wonder that lives within us all." "To Museum of Ice Cream, experimentation is the soul of creativity, innovation and the core of our ever-expanding community. SWEET SCULPTURE STUDIO challenges you to explore your creativity through flavors, treats, and ice cream delights that are as grand and robust as your imagination." For a little more calorie burning, we got to play ping-pong while overlooking sunny Miami. Having spent most of our adventure inside this four story wonderland, it was easy to forget that we weren't actually at the pink cousin to Willy Wonka's Chocolate Factory, but still in vintage Miami Beach - a treasure more special to me than all the ice cream in the world. "POP is the perfect spot to stop, chill out and enjoy the majestic view. Surrounded by a popsicle-city frozen in time, POP prompts you to appreciate the moment and reflect on your journey." Last week, Pantone announced the color of the year for 2018. This is big, in color news, mind you. Pantone practically says "Jump!" and designers around the world say, "In what color?" For 2018, Pantone enchants us with Ultraviolet. 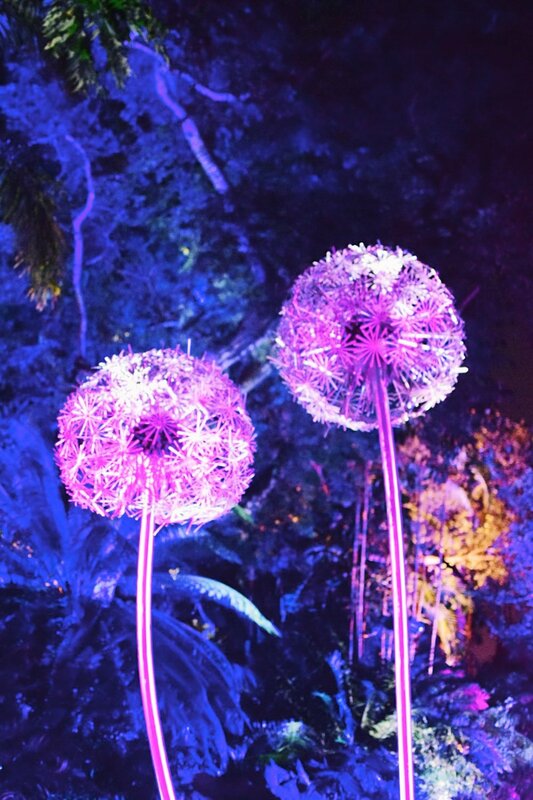 "Historically, there has been a mystical or spiritual quality attached to Ultra Violet. The color is often associated with mindfulness practices, which offer a higher ground to those seeking refuge from today’s over-stimulated world. The use of purple-toned lighting in meditation spaces and other gathering places energizes the communities that gather there and inspire connection." Ultraviolet has long been known for its spiritual capacity - especially in my family. 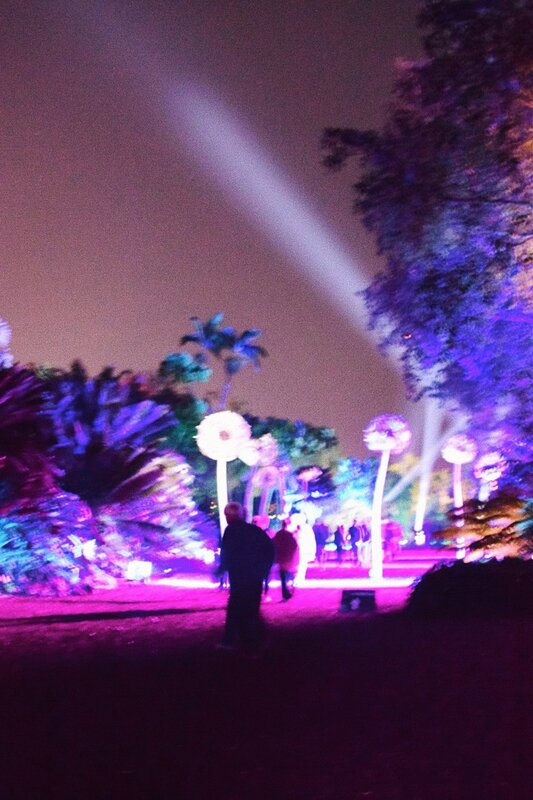 I can think back to several instances in which I've been encouraged to surround people and places in "violet light." For example, during Hurricane Irma that was projected to barrel towards Miami, causing my friends and family to evacuate, I was asked to surround our home in violet light. To simply visualize the purple-ish aura around our house in order to keep it safe. "[Monet's] enthusiasm rubbed off on his Impressionist peers, and soon the group’s penchant for the hue was being described as “violettomania,” a purported symptom of hysteria. Supporters of the Impressionists, however, believed they had “an acute perceptual facility that allowed them to see ultraviolet light at the extreme edge of the spectrum, invisible to others’ eyes,” as Stella Paul explains in her book Chromophilia: The Story of Color in Art." "Similar to the Impressionists, [Georgia O’Keefe] didn’t seek to depict reality. Rather, she used color and form to convey more intangible forces—here, warmth, sensuality, and vigor." "Abstract Expressionist painter Mark Rothko also played with the color’s religious associations when he filled his magnum opus, the Rothko Chapel in Houston, Texas, with maroon, plum, and deep mauve canvases. Unlike Bacon’s figurative approach, however, Rothko focused on the soothing, meditative power of the violet spectrum. During the same era, James Turrell began experimenting with his ethereal, immersive Light and Space environments. Some he lit monochromatically with deep, diffused fuschia; the experience of entering these spaces has similarly been described as religious." Patented in 1856 by Scottish chemist, William Perkin, Mauve was the first synthetic based dye, also referred to as a coal tar color. Perkin originally referred to this pigment as "Tyrian Purple" to up its appeal, though it is rumored that his critics called it Purple Sludge. Dim and dark, Mauve embodies the ability to block out any unwanted noises in life. Tap into Mauve's dusky aura to re-center yourself. A synthetic pigment commercially known as Nuremberg Violet, Manganese Violet is heat-proof and non-toxic. It has been used in frescos and paintings, though tends to tint them unfavorably. Earthy and quiet, Manganese Violet radiates a warmth that grounds you and brings you back to your roots - whether that be physically or mentally. Allow yourself to feel anchored by its safe embrace. 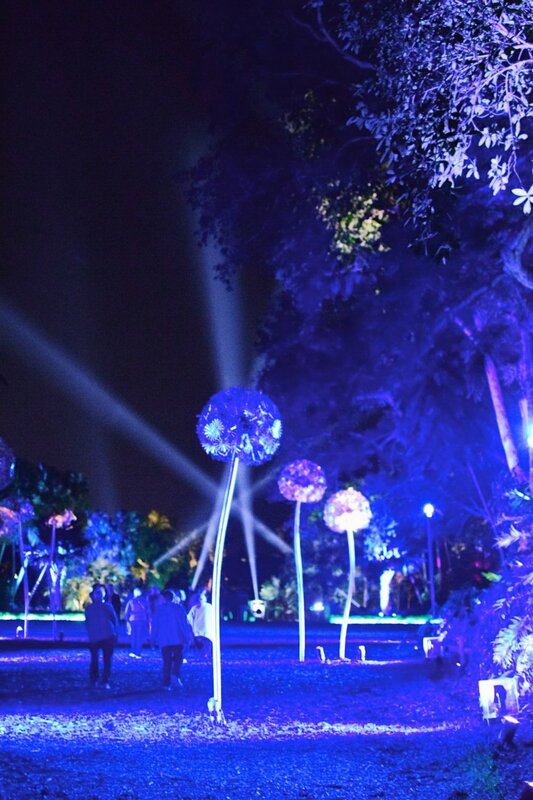 So, as the year closes and we prepare to welcome 2018, keep Ultraviolet in mind. If not for it's powerful, emotional resonance, than for the mere fact that it is a simply soothing shade. I made it home to Miami on December 9th, the last weekend of Art Basel, as if purposefully celebrating my semester without final exams! With only two days left of the festivities, and VIP tickets graciously afforded to us by our aunt and uncle, my sister and I spent Saturday at the Convention Center and Sunday at Untitled. Having been to Art Basel several times before, I realize that each trip is a little bit different for me. 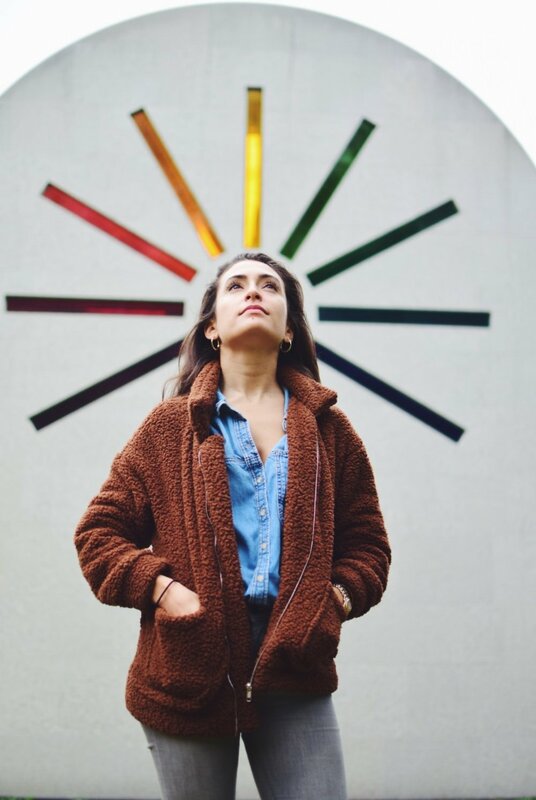 It started out in High School (when I hardly knew anything about art aside the fact that I liked it and neon installations were my favorite), scampering off to Miami Beach with friends because everyone was doing it. Now that I study History of Art & Architecture at school, and everyone I know expects me to rattle off interesting facts about every visible artwork, I feel an obligation to perform but also a relieving freedom at Art Basel. For people who hardly know what they’re doing when they go to Art Basel (still me), it can be overwhelming to want to see everything. And I mean everything. The Convention Center is riddled with booths and packed with people. And if you aren’t going to purchase anything, which most people my age can’t even dream of, you find yourself in this limbo of consumption vs. appreciation. Art Basel, to me, is a curation of the now. It’s not as thematic as a museum exhibition, nor as haphazard as a street fair, but a sophisticated in between - where you can survey all of the offerings and notice some patterns in what’s up for grabs. That’s how I like to view it. I like noticing what people gravitate towards, I like seeing everyone get dressed up and put on their largest statement earrings, and I like admitting that I don’t know everything about what we’re seeing. But I do know some things. This year, my sister and I walked past some colored canvases. You know, the ones that are planes of color that prompt people to say, “I could’ve done that!” Well, in the words of the MoMA poster I have hanging in my dorm room, “Modern Art = I Could’ve Done That + Yeah But You Didn’t.” She asked what those canvases were all about. After a mini spiel about Rothko’s and color fields (is that even the correct explanation, I hope so! ), I admitted to her, “But yeah, sometimes I think I could’ve just painted that too.” And she loved that answer. She loved how human I had responded, and how I tried to explain it to her in a digestible but not pedantic way. To me, that’s the beauty of Art Basel. You are exposed to great art, but you don’t have to be expected to “get it.” You can walk up and down the aisles and glance here or there, and not be scowled at for taking less than a minute to assess if you like the work or not before you move on. Because, let’s face it, if everyone took to Art Basel the way we tend to spend our time in art museums (staring at one work for an extended period of time), Art Basel would have to be way longer than a weeklong show. Here, in the fast paced flow of the shows, you’re free to Look, Like, Smile, and Repeat. Art Basel, you’ve done it again. You’ve replenished my soul with beautiful things to look at, an opportunity to learn the different tastes of the people I went with, and an excuse to simply enjoy an art-filled weekend with my family. Seasons are such a novel concept to me. Growing up in a land of Hot, Extra Hot, Extremely Hot, and Unbearably Hot, the idea that a a spectrum of degrees from 0 to 100 (real gradually) could occur in the same location was unimaginable. Sure I had seen pictures of fall foliage and heard songs like White Christmas, but seeing was really believing when I set up shop in Cambridge for my first Northeastern fall two years ago. I remember noticing the first leaves change color. I was walking to class and almost stepped on a treasure: a small, raindrop shaped leaf that was predominately brown, but budding red from its core. Naturally, I picked it up and put it in my phone case (temporarily replacing the Polaroid photo of Fairchild I normally keep in there). Once I made it safely home that day and the precious leaf had survived the voyage, I transferred it to the safety of being sandwiched in between pages of my idea journal - a location it lives in to this day. 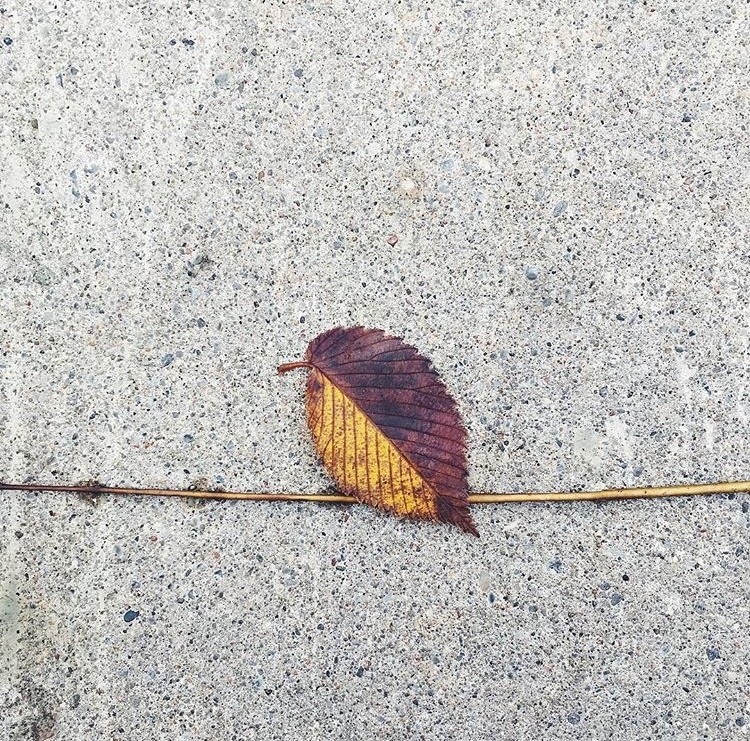 Now, every fall, I make it a point to find that first leaf, radiating with disjointed color, begging to be cherished. This year, I took that singular hunt to the next level. I'm talking waking up early on a Friday morning to intentionally collect a tote bag full of foliage with my adventure buddy Lily. Together we collected a decent smattering of hues, from perky yellows to velvety reds, and some foundational greens for good measure. With all of these vibrant shades radiating in my room, I couldn't help but draw parallels in their graduating tones to the collection of Pantone chips I oh so handily had stashed nearby. Lily and I matched each leaf to each Pantone chip, debating whether to match the leaves by their core color or their outer color, and settling for a combination of both. The final product looked like a spilled package of Mike & Ikes as much as it recalled imagery like Spencer Finch's Where Does Red Begin and Where Does it End? Fall, to me, is the most robust expression of nature's own color palette, and now I've captured it to enjoy - despite the current status of barren trees and winter looming. “Scratch and sniff memory wall by Erin Jang & Leah Rosenberg” an introduction to a colorful experience and sensory overload. Here at The Color Factory, to smell is to remember, and to see is to be supplemented. The colors serve to visualize the imagery evoked by the scent - a threefold, transportive experience. Moving through this room, you prepare yourself for what you’re about to enter: a world of hues, an interactive playground, and a way of experiencing color like never before. The rooms ranged from projections of individual perceptions of color (think the orange room depicting the black identity by Tosha Stimage) to invitations for the visitor to enact their own interpretation of color (think wadding in a yellow ball pit, in a yellow room, with a yellow ice cream treat to conclude). Other rooms blurred that boundary in a rainbow haze. The room with rainbow streamers, for example, meant a visual catalogue of t-shirts and bridges and pencil paintings to the artist and playtime for the visitor. In the Color Factory, the visitor was not only a viewer nor a consumer, but an active agent in exploring what color means and what color can do. From that encounter forward, I wanted to personally prove the ways in which color taps into a way of resonating with a viewer that other artistic qualities cannot. To see color is to recognize memory. To be surrounded by color is to have the ability to alter your mood. To walk through the wall to ceiling realms of color in The Color Factory is to experience firsthand the emotive and whimsical powers of color. Some of the rooms I felt best melded color + senses + experience were the disco ball room and the Chapel. The first being a dimly lit dance party in which shimmers of silvery light twinkled around you as you selected aptly titled songs like Man in the Mirror. In this room, a literal translation of color was applied to connect the visitor to the far-reaching depths of color in other media. On a more emotional level, the Chapel brought together allusions to stained glass and silence while bridging two rooms of active engagement: the Confetti room where snow angels and sorority sister blow kisses were a must, and the Purple Surveillance room which printed out selfies of people who were aware of the project. In between two “louder” rooms sat this still, reflective space. Where color filtered in and bathed you. Joy and replenishment washed over you. And, for a brief moment, you felt simply thankful to be there. With an upbeat yellow crescendo to conclude, the Yellow Room featured every monochromatic lover’s dream. From wall to ceiling, everything was yellow and you couldn’t help but feel happy - the ball pit surely helped nudge that sentiment along. But emerging from the exhibit with a yellow ice cream in one hand and a map of secret installations all around San Francisco in the other, I, personally, couldn’t help but feel like my soul was recharged. It’s as if I was re-injected with all the vibrant colors I grew up on in Miami that the classic redbrick vibes don’t quite satiate here in Boston. And the fun didn’t stop once I left those rainbow doors either. 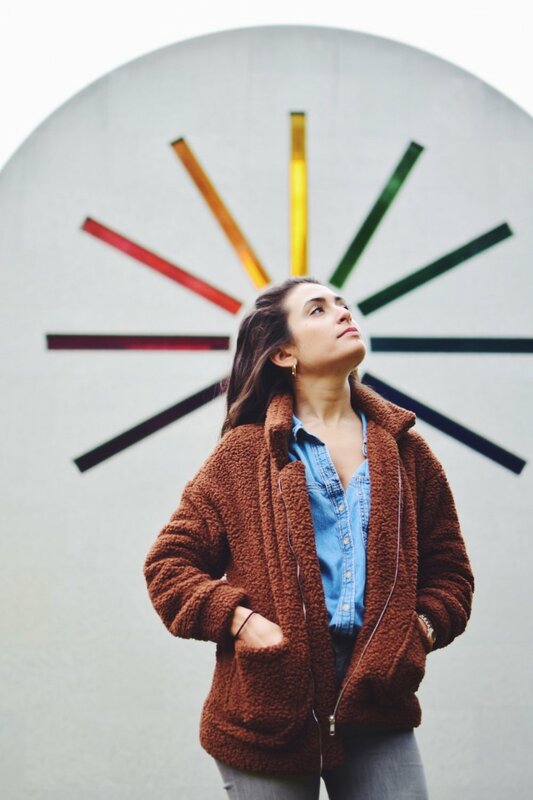 Scattered around the city like a treasure hunt were several other installations, ranging from a mural of favorite foods to a jukebox claiming to showcase what color sounds like. All in all, The Color Factory served to further the discussion of color’s capacity to be more than a decorative afterthought. But for the conclusion to that argument, you’ll just have to wait to read my thesis. First, as a minor synesthete, I grew up feeling strongly that colors had personalities. I remember always being asked to pick my favorite in elementary, and struggling internally to say one I loved without hurting the “feelings” of all the other colors. I also remember owning an extensive collection of pens and highlighters in middle school, and when being asked to name one of the more peculiar and original shades that Sharpie had just released, I instinctively blurted out Electric Salmon. Second, growing up, as much as I loved colors, my mom loved the Universe – specifically the power of numerology. A fond believer of “everything happens for a reason” my mom taught me how to trust in the Universe and its healing capabilities. From pursuing alternative methods to medicine like homeopathy to frequently finding ourselves in stores that have extensive collections of crystals and sage, I soon learned how capable colors also were in the healing process. And when she gifted me a coffee table book called “Colorstrology” in which you can look up your birthday and read about the color that best suits you, I was amused and intrigued and realized that color’s history, its substance, and its context link inextricably to our perceptions and experience. "Color is ephemeral and complex. 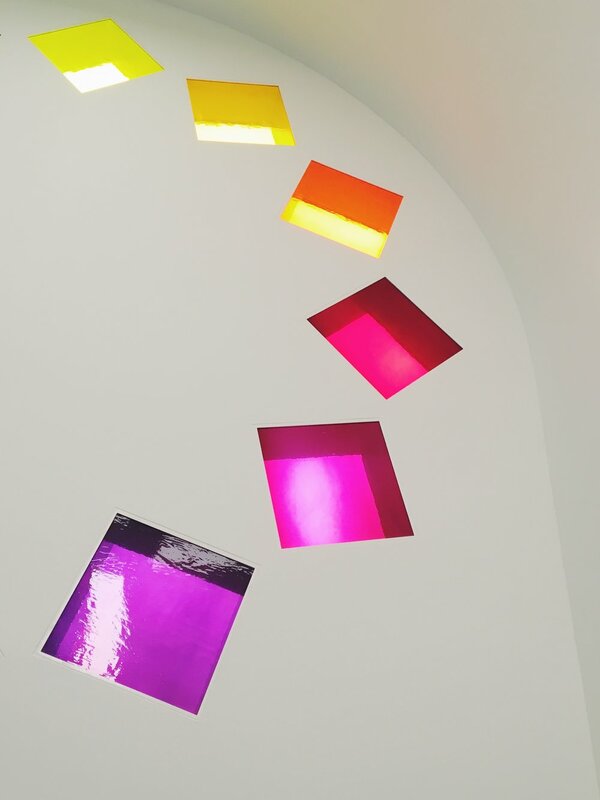 An installation in the Lightbox Gallery at Harvard Art Museums, Color Rx contended with the individuality of perception, while maintaining that the experiences in which perceptions are grounded can be traced back to, and tethered together by, a common, colorful trend. Drawing inspiration from Harvard Art Museums’ Forbes Pigment Collection, scholarly texts, and the artist’s knowledge and intuition, the piece explored lines between truth and belief, color and illusion. And yet its prescriptions, unconventional and mysterious though they may be, made connections and produced impacts in the world, for gallery visitors and others. Color Rx used a computer algorithm to diagnose a viewer’s inputs and “prescribe a color” in response. The piece was grounded in questions about trust in, or benefit from, “smart” systems, often in contexts where the algorithms are opaque—even when the output is very concrete. What does it mean for machines or systems to drive our behavior? Can we adequately assess the benefits and risks?" Set up as a pop up installation in the Lightbox Gallery of the Harvard Art Museums, visitors were able to approach a keyboard and type in a response to the provocation, "Think about what you need and tell me in 1-3 sentences." The thinking behind that phraseology was simply that I wanted to elicit a thoughtful, heartfelt response from my viewers - one in which I could attempt to "detect their mood" and provide them with a color to supplement it or just to make them smile. The white walls of the space itself lit up as the 9 screens flickered with changing color prescriptions, and the visibility of the pigment collection on the floor below allowed the visitors to directly understand the relationship I was drawing for this project. Friends, colleagues, and museum visitors alike all found their way to my gallery and engaged with the algorithm. After receiving their virtual "prescription," visitors could pick up a tactile "print out" of their Rx, cleverly attached to a paint chip of their prescribed color. How did I match the colors to the emotions? Well, I took the 36 most "emotionally resonant" pigments in the Forbes Pigment Collection (for me), matched all of the pigments to commercially found paint chips, and drew associations between hues and affect. With this comparison, I did not attempt to provide a direct correlation between the pigments and paints I chose, rather I used the paint chips as physical proxies for the pigments in hues that, to me, behave similarly. 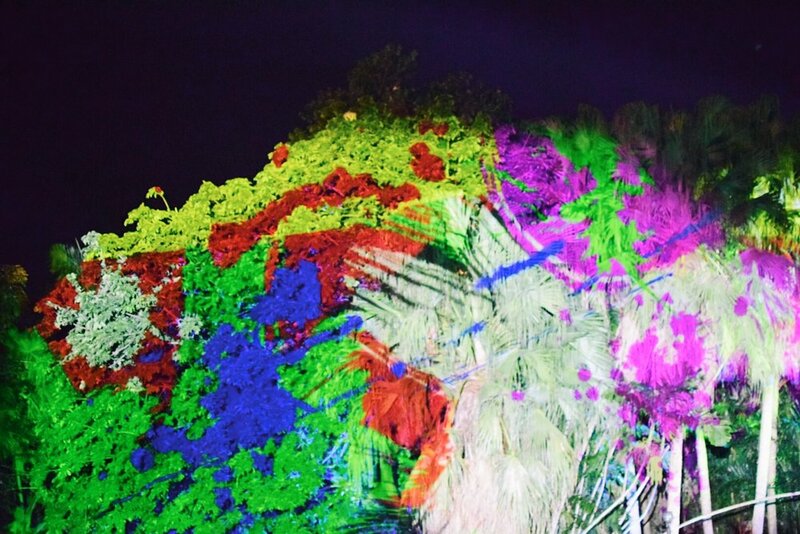 Color Rx proved to be not only amusing and uplifting for visitors, but instrumental and enlightening for me. I know those are rather sweeping claims, but when you have the opportunity to exhibit your own creations in a space you never thought you'd get to make your own is truly a remarkable feeling. So thank you to everyone who helped make it happen, from metaLAB to the museum to my mother - my young life just got a lot more colorful. As I settle into the swing of this new semester, one filled with courses in different departments that somehow all interrelate (go liberal arts! ), this question seems to keep popping up. Given that the add/drop deadline is today, my class schedule is finally finalized, and it features topics like Neuroaesthetics, Science & the Practice of Art History, and Tangible Things. Each course touches upon the beauty of objects in their own way - from science, to history, to perspectives of conservation. 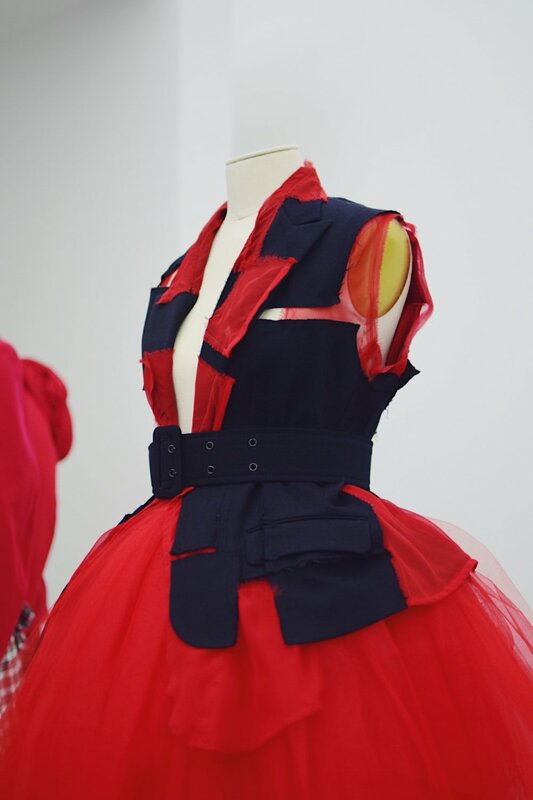 Back in mid-July, I had spent a weekend in NYC to reconnect with friends and, to be honest, see the Comme des Garçons Exhibit at the MET. Both of those goals were accomplished, alongside other adventures, and ever since I returned I've just been sitting on this pile of photos, wondering the best way to write about the experience. 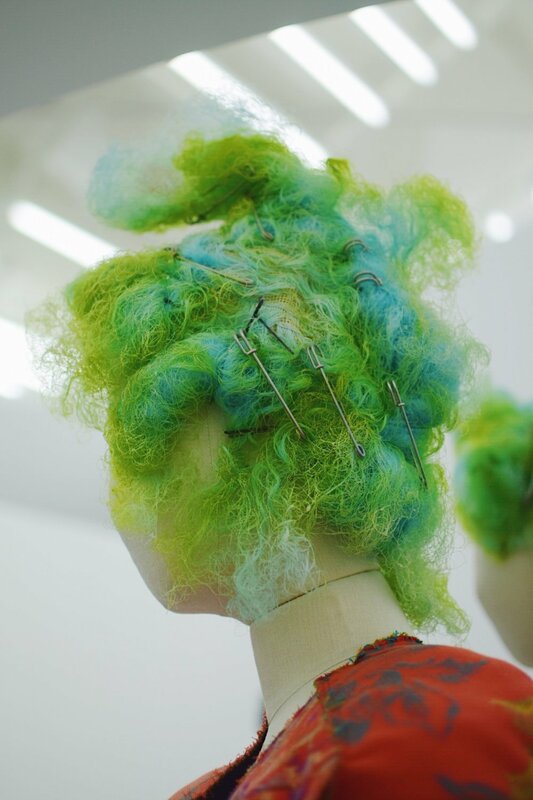 It wasn't until last week, in my first class of Neuroaesthetics, that I realized what would be most fruitful: trying to figure out if fashion, to me, is in fact art. To prepare for that week's discussion, our class read/heard perspectives from the likes of Tolstoy, Dennis Dutton, and Valerie Steele. Steele's talk contended with fashion directly, and her claims felt like thoughts I was on the cusp of materializing myself, yet being expressed better than I ever could. She started her talk by wondering if seeing a Balenciaga bag in a museum exudes the same "aura" as art. 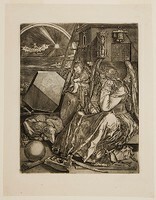 Now, as a budding student of art history, I instantly understood her question as a reference to Walter Benjamin and his proposal that the "aura" of a work of art is devalued by mechanical reproduction - thus emphasizing the importance of a unique, one of a kind work. This reference underscored some of Steele's other points, namely that ready to wear or commercialized fashion isn't as readily seen (or shouldn't be seen) as art, perhaps because of its mass produced quality. I agree with that. I don't sense as much majesty or artistry in an overpriced tee you can snag from Urban Outfitters than in a uniquely made gown or costume. However, this isn't a definitive restriction for my perception of fashion as art. I think this opinion forks off in two other ways. One fork spurred by a comment made by my friend, classmate, and fashion icon, Lily, where she noted that there is an art to how you put yourself together, even if you're sporting an UO t-shirt and not a CDG original. The other fork being that, to me, a unique piece is still a work of art regardless of its display in the MET or simply featured in your local blackbox theater. A bewitching performance? For me, that sounds a lot like a runway show. You hear the music pulsating, feel the lights dance, and watch in rapture as the models flow by - fleeting quickly as if expediting the ephemerality of their art. All of these ideas and opinions, shaped inside and outside of the classroom, felt, in hindsight, inextricably tied to my experience at CDG. First things first, I loved it. There's something magical about clothing's ability to tell a story, to weave a narrative, literally. Everywhere I turned, there was a new crescendo of costumes. Even some displayed up above (not lending itself well for viewing, but definitely contributing to the immersive experience of being enveloped in all of this fabric). I also appreciated the lighting. The stark whiteness of the walls and bright beams of light allowed each work to jump out at me - and made capturing them in photos significantly easier. 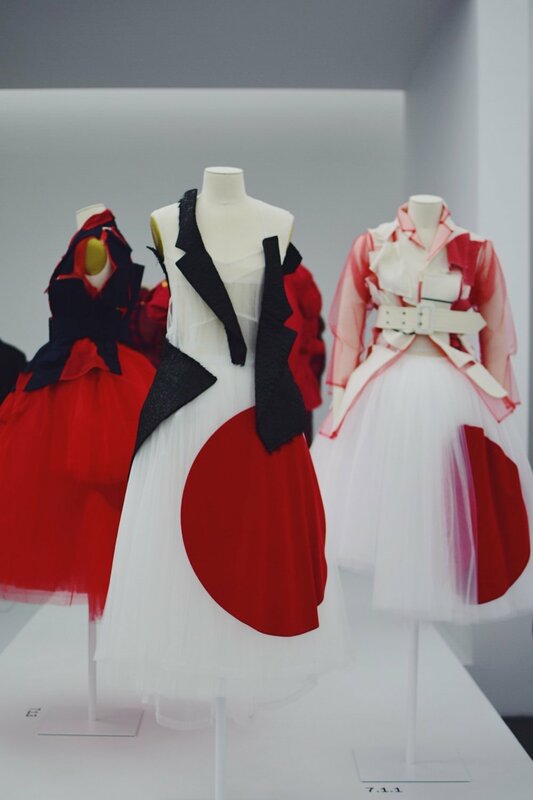 "Objects are organized into nine aesthetic expressions of interstitiality in Kawakubo's work: Absence/Presence, Design/Not Design, Fashion/Anti-Fashion, Model/Multiple, Then/Now, High/Low, Self/Other, Object/Subject, and Clothes/Not Clothes. 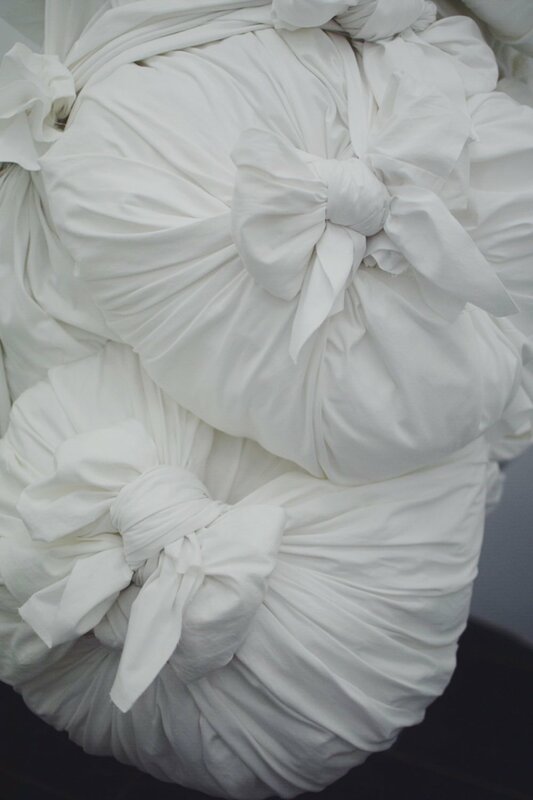 Kawakubo breaks down the imaginary walls between these dualisms, exposing their artificiality and arbitrariness." 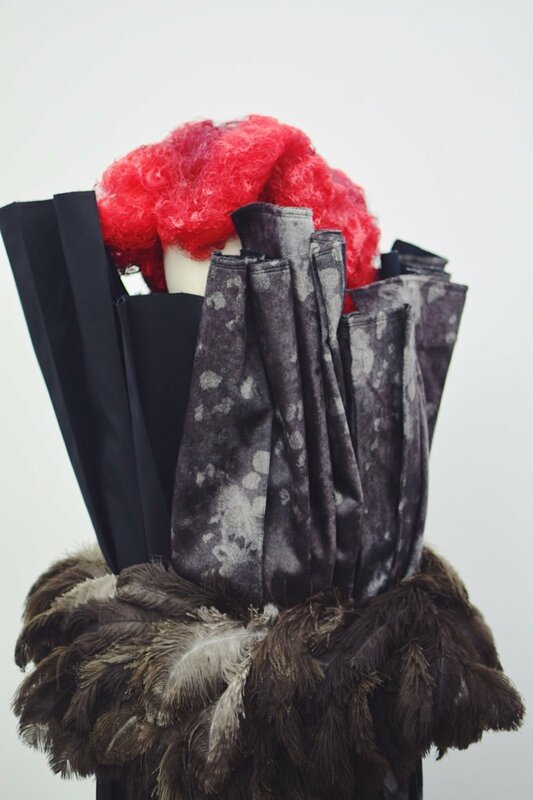 After chatting further about the show with my Neuroaesthetics professor, Nancy Etcoff, she casually remarked that avant-garde fashion, like that of Kawakubo, presents us with "walking ideas" - something that I think is incredibly useful in thinking about fashion as art in particular. I mean, all art, to some extent, aims to convey the ideas of its creator. So why exclude fashion from the list? I will say, however, that leaving the show and being immediately confronted with a CDG pop-up-shop that boasted overpriced tees emblazoned with a teensy logo really begged the question, "Is fashion art?" To wrap up our portion in Madrid, we snuck into the Reina Sofia an hour before opening to receive a private lecture by our Professors in front of Guernica, all by ourselves. And once that clock hit 9am, boy were we flooded with traffic. This was probably the point of the trip when I realized how fortunate we were to be traveling with such brilliant people and doing such VIP things. This thought was confirmed when one of my classmates whispered in awe, "Wow, I can't wait to come back in see this." (probably in regards to one of our Mosque-roof-access excursions), to which a professor responded, "You're probably never seeing this again." And rightly so. These views were spectacular, and made even more so because of their rare, almost unicorn like, status. We were probably never going to see Spain like this again, so what'd I do? Split my time between soaking it in and photographing it, for institutional memory of course. Post Morning At the Museum (think Ben Stiller level, but AM), we ventured to El Escorial where someone tried to sneak into the Courtyard with us, but our super cool security guard was not having it.